Ice Fishing Report December 31, 2010 Ice Fishing : I guess it's going to be kind of tough for me to put the good spin on the fishing report for the last day of 2010. I can usually find something encouraging to say almost every day, but on Thursday we all had the same dilemma, no choice but to hole up and wait to see how much of a storm we were in for. There were some folks fishing in the morning, but gradually, the weather deteriorated and by late afternoon, much of the local traffic was shut down. There was good news though, even though I had to skip my Pheasant hunting trip to South Dakota, I talked with my buddy Chad Haatvedt last night and my friends did manage to make the trip. He said that they just barely beat the weather and arrived safely, but it wasn't an easy ride down. They'll be hunting today, so hopefully I'll at least be able to see pictures of their birds. Hey, for me, there's not going to be much talk about fishing today. It looks like I can plan on moving snow for most of the day so that tomorrow, I'll have room to move the snow that we're going to get tonight. Starting now, most of us who want to ice fish are going to get pretty dependent on plowed roads for a while. I'll stay on top of where the best accesses are and update that tomorrow after folks get moving again. If you're not already here, but planned to make the trip this weekend, please think twice and check the travel advisories before you start driving. Ice Fishing Report December 30, 2010 Ice Fishing : I know it sounds a little crazy to hear someone say that they're hoping for colder weather, but if you want to get out on the ice, that's what we need. The warm up over the past few days has been nice, but it's been working against travelling on the ice. On Wednesday I thought I'd snoop around for something different to do, so I headed over to Deer Lake. It was heaven for the snowmobilers who were out playing on the lake, but a disappointment for me because I couldn't dind a decent way to get fishing gear out onto the ice. I got my truck stuck at the landing almost immediately and wound up settling for a nice walk instead of a fishing trip. I still wanted to see what the conditions were like out on the main lake, so I hoofed it out about a half mile just to see what it looked like. The snow isn't all that deep, but thanks to the warm weather, it's packed loosely and felt slippery under my feet. It looks like the ice is good, there's been a lot of snowmobile traffic out there and it appears that they've been moving around freely, but in certain places there was slush under the snow. So back to my original point, we need another cold snap to re-freeze the slush and loose packed snow. Once we have that and if we don't get blasted with a bunch of new snow, then travel by ATV should be fairly simple again. 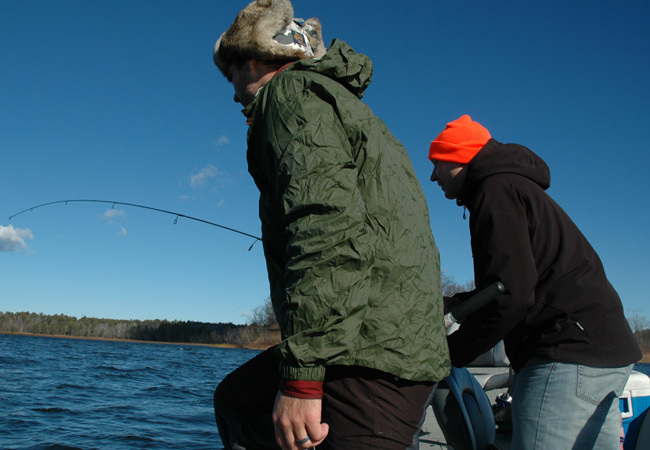 On Lake Winnie, most anglers are reporting average fishing. Most anglers who are Walleye fishing are catching enough fish for meal, but not many folks are wearing out the drags in their reels. The best Walleye action continues to be out in the center of the main lake, with some additional good fishing reported by anglers fishing the shoreline drop off along the south shore. On Tuesday I got a fishing update from Chris Dunker at Big Wolf Resort about the rental houses they have on Lake winnie. Chris says that most of the action for their clients was in the houses located over 20-22 feet of water. The clients said they were using Macho Minnows tipped with two cut pieces of a minnow. Walleyes were acvtive from about 7 AM until around 10 AM. They caught two Walleyes that with were "in the slot" AND the remaining 6 were nice keepers between 15-16.5 inches. Perch action on Winnie has been slow for most, but some above average catches are coming in. On Monday, Chester Powell and Cassie Vollhaber got onto a nice location and had some really Jumbo Perch fishing. I've been chipping away at the "Winter Lodging" and Ice Access information and will set that up as a chart during the next few days. For now, re-read the information below occasionally because I add the new information as it comes in from the resorts. You may find a couple of new ones every day. Leech Lake, anglers going out of Brindley's Harbor are catching a mixed bag of Walleye and Perch. The action has been hit and miss, but the best action is still coming. 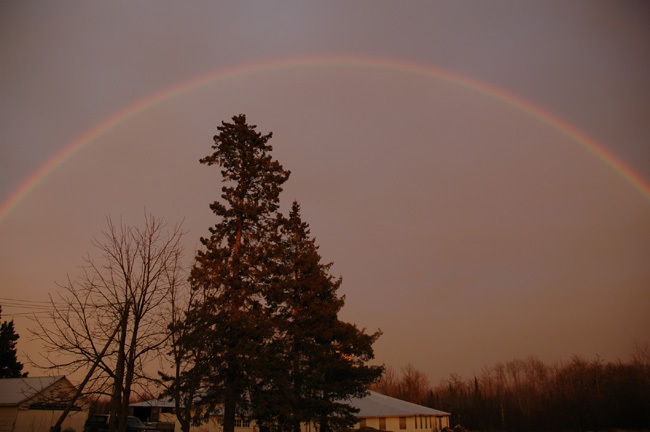 I got a report from Darv Oelke at Bowstring Shores Resort. Darv reports that fishing on Bowstring has been fair, a few Walleyes and Jumbo Perch are coming in and the Northern Pike are plentiful. He says that the ice thickness is about 14 inches. Angling traffic on the lake has been light and so far he's seen very little vehicle traffic. He has been driving on the lake with the pickup and has 3 "wheel house rentals" out on the lake right now. Hey, I guess we're playing it by ear today as we wait to see what the weather brings. I'm sure I'll get outside later on to check on things. In the meantime, I'll be chipping away here on the computer. Ice Fishing Report December 29, 2010 Ice Fishing : On Tuesday we had one of the classic winter break warm ups. As far back as I can remember, we've had these bursts of spring like weather just after Christmas and even though I know it will get cold again soon, it's sure nice to be able to get outside and enjoy a few days of gorgeous winter weather. Too bad for me that I spent my day working instead of being out on the lake. Hey, I'm planning on making up for that later today, but yesterday I did have an hour of quiet time at the end of the day. I can't explain why, but I had this sudden urge to go sit in the Deer Stand and see if the Deer would be moving toward evening, oh man, am I ever happy I did that! The warm, calm weather was really encouraging the Deer to move and for an hour, they were everywhere. I still didn't see any bucks, but as it got dark, I was up to a count of 17. If you count the three I stumbled into on my way out, that makes an even 20. Not bad for a place where I only see a few deer during the entire hunting season. Oh yeah, fishing; According to the worm girl at Fred's Bait, the shop was packed with anglers again on Tuesday. Lot's of them are heading to Red Lake where the Walleye fishing has been steady since the season opened. The ice conditions on Red are still good on the South side, but they're battling problems with deep snow and thin ice out in the middle and on the North side. You'll find good plowed roads on the south end, but few if any, to the North. There are also a ton of anglers taking their big "wheel houses" up to Lake of the Woods. Fishing there has also been slower than average for this time of the season, but almost everyone is catching enough fish to make it worth the effort. Ice Fishing Report December 28, 2010 Ice Fishing : On Monday, the wheel houses started showing up from everywhere. According the folks at Fred's Bait in Deer river, they've been swamped with anglers coming in to get supplies as they make their way to set up the big rigs. Right now, there's a lot of traffic heading for Lake Winnie, Red Lake and Lake of the Woods. Right now, about 85 percent of the operators that provide access raods and winter rentals are open and in full operation. By the end of this week, most of the others will also be up and running. Fishing reports continue to be a spotty. The early Crappie and Walleye spots that provided some of the better action last week, have been fished hard now and the pressure has slowed the action down. The best bet for anglers getting set up for the next week will be to branch out and find some fresh locations. As long as we don't get too much more snow, travel on the ice will continue to be good. 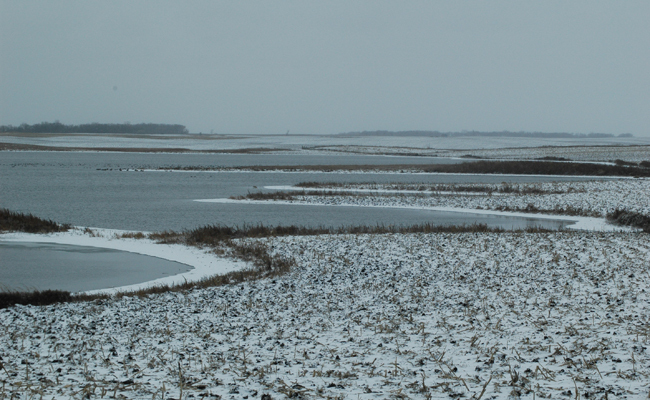 There's about 8 inches of snow cover on most of the Deer River area lakes and drifting has been minimal. The ice access reports that I have posted below, also provide a sketch of where the fishing action has been best. For me, the day will be consist of playing butcher boy as I and some friends carve up some pigs that we bought from a local farmer. I know, that doesn't sound too glamorous, but it will be really good food when we're finished. I think I'll be able to make a trip out to the lake on Wednesday to see if I can drum up some new spots myself. Hey, I can't believe that I made such a dumb mistake, I must have eaten too much Rum Cake or something! Yesterday I said that I and Matt Mattson were planning our attack on the Walleyes at the Rainy River for this spring. I added that it was only 4 months away, but it's really only 3 months away!!! Yes, that's right, in fact it's only 94 days until April 1st. Oh man, where did the winter go? Ice Fishing Report December 27, 2010 Ice Fishing : On Sunday we were blessed with our first sunny day in at least a week. it was probably one of the prettiest trips up the highway I'll get this winter, the snow was pure white and hadn't been blown out of the tree branches yet. While the bright sunshine was gorgeous to look at, it didn't seem to do much for the fishing, but who cares? Crappies and Sunfish had been hitting well on Cutfoot Sioux, so we decided to try that. We arrived at the landing at about 12:30 and it was packed, there were rigs parked everywhere, so we decided to park my truck on the ice. As we unloaded the Otter and the 4 wheeler, one pickup truck drove past us and headed toward the shore from somewhere out on the lake. There was another set of truck tracks heading the same way we were going, but since we had the ATV, we decided to play it safe and use it. Before we were finished, we'd end up seeing at least a half dozen full size trucks driving around and none of them had any trouble getting around in the snow. Next time, I'll leave the ATV home as well. When we started fishing for panfish, we discovered that it was a lot easier to see fish on the flashers than it was to get them to strike. Fishing the same area(s) that had been good earlier this week was not working at all, so I headed toward the weedline hoping to find some Perch and maybe a Walleye or two. On a shallow point adjacent to a deep hole, I drilled a half dozen holes and started hopping around. I had a lot of Perch action in about 7 feet of water, but they were mainly small fish. Still, it was getting cold on the ice and I decided to set up the Otter and stick with this area. There were flurries of action occasionally and we did manage to save enough to send Matt home with a meal, but overall it was slow. We'd hoped that there would be a few Walleyes making an evening run, but this didn't materialize either. Hey, believe me when I tell you that even a slow fishing day beats the heck out of sitting around with all of those Christmas cookies staring me in the face! It was absolutely wonderful to spend the afternoon with my pal, planning our strategy for the April Walleye run on the Rainy River, which by the way, is only 4 months away! Ice Fishing Report December 26, 2010 Ice Conditions: Today (Sunday) will be a busy day around the Deer River area. It's nice having an extra day off after Christmas and this gives many of the local anglers a chance to get on the ice before going back to work on Monday. My buddy Matt Mattson is heading this way today and we'll be out on the ice looking for some more Crappies and Sunfish. Hey, I haven't made the rounds for a couple of days, so today it will feel really good to get back up to speed. I'll be on the prowl for some new photos and new reports and while I'm at it, I may even stop for a minute just to hear the peace and quiet. Have a great day! Ice Fishing Report December 25, 2010 Ice Conditions: HEY! Merry Christmas. As you would expect, fishing news was slow on Friday as most folks prepared for their Christmas weekend. I did have time to add a couple of notes to the winter access section and I did talk to a few of the Deer River area local anglers who managed to squeeze in short trips yesterday morning. Panfish action in the area continues to make the most news. Several of the anglers I've talked to are easily catching their limits of Crappies on the smaller lakes. The pattern is almost identical wherever they go, find the deeper holes and concentrate on the flat areas just outside the deepest water. We've had several days of cloudy, dark grey skies and I think this is contributing to the fact that many of the local anglers are catching Crappies during the daytime rather than only at dusk. Use your favorite baits and you'll probably catch some fish, but the Diamond Jigs, Demons and Ratfinkee are the ones that keep getting mentioned around here. If you're on a lake where mixed Sunfish and Crappies are possible, stick with the grubs like Wax Worms or Euro Larvae. Finally, use good, fresh two pound test line and you'll catch more fish. Travel conditions on the lakes are still generally good, but the recent snowfall has made many of the local anglers nervous. Not being able to see what's under the snow can be a problem when you're trying to plot a course accross ice that hasn't had any traffic on it. Most of the guys I've talked to have opted to keep using their ATV's on the smaller lakes until we get the next hard cold snap. If you're counting on driving, stick with the plowed roads or use the routes that you know have already been travelled. Hey, Thank you for the smiles and the kind words, be safe and have a fantastic weekend! Ice Fishing Report December 24, 2010 Ice Conditions: Weather conditions have been stable, Thursday was the third day of moderate temperatures and light winds. The slate grey sky forces us to look a little deeper to find the beauty of our recent snowfall, but if you do, you'll find it. I managed to get most of my work wrapped up in the morning and made my way up to Cutfoot Sioux, where I met Bill Powell at around 2:30 PM to try for some panfish. At the landing, snow was loosely packed and it's got a few ruts from traffic, but it's still passable. We weren't confident about taking the truck out, so just to be safe, we used the ATV to take our portables out to the fishing spot. There wasn't any trouble getting through the snow with the 4 wheeler and if you were driving a light truck, I don't think that would be too bad either. The snow has become moist, but not slushy and another cold snap would really firm it up. We drilled a half dozen holes in the same area that Bill had fished a few days ago and after a little moving around, each of us found spots that were "good enough" for us. The fish were visible on the flashers most of the time, but it was really tricky to get them to bite. Playing cat and mouse, lift the jig, then wiggle it, then drop it and so on...For me, about every 5th fish I spotted could be coaxed into biting. The majority of the fish would stay interested as long as the jig was moving, especially upward, but let it sit still too long and they'd lose interest and sink back down to the bottom. The water depth was 23 to 24 feet and it was a mixed bag of Crappie, Sunfish and a few Tulibees (Ciscoes). I caught a few fish on a #6 Glow Bug, but Bill was using a Red/Glow Diamond Jig and that seemed to be working better. We tipped the hooks with 2 or 3 wax worms or Euro Larvae. On the shoreline, friends were fishing the weed edges for Walleye and Perch and had similar results. 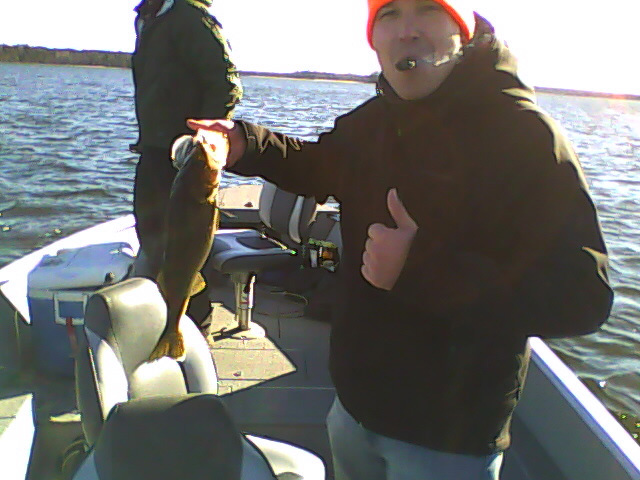 They caught a handul of keeper Perch and a few Walleye fishing with small jigging spoons tipped with minnow heads. They fished in depths of 7 to 10 feet. Hey, This was a really nice way to spend the afternoon, it might have been faster action in a different location, but it was one of those nice, calm times when you feel like you're winning the game one step at a time. I've added a few more updates about ice accesses in the area and I'll keep this going for a while so it's easy to find. Some of this is repeated from yesterday, but it's a good idea to skim through it and check for additions as the information trickles in. 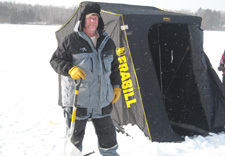 Ice Fishing Report December 23, 2010 Ice Conditions: In the aftermath of Tuesday's snowstorm anglers in North Central Minnesota have some good news; travel conditions on most of the Itasca area lakes remains good. Snow depths on area lakes of 5 to 8 inches will be enough to slow down some travel, but so far, there's not enough snow to shut it down. The main concern right now is the condition of access ramps and the roads leading to them. 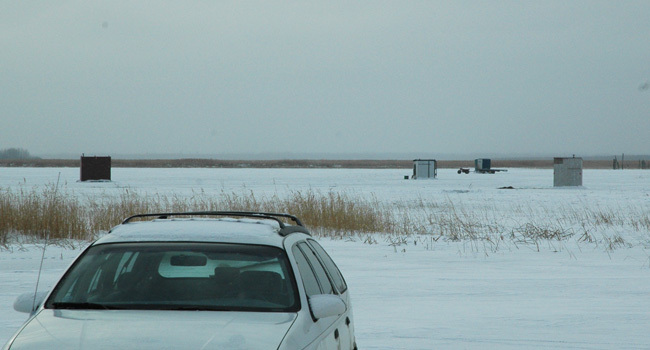 I took a tour of some popular landings yesterday (Wednesday) and found that snow at the landings is messy, but still passable and anglers were still driving pickups on the ice without too much trouble. If you have a larger "wheel house" or heavy ice shack, you might have to pick you spots more carefully than before, but you will be able to get out at most locations. For the moment, one landing to avoid is the Birches on the East side of Winnie. 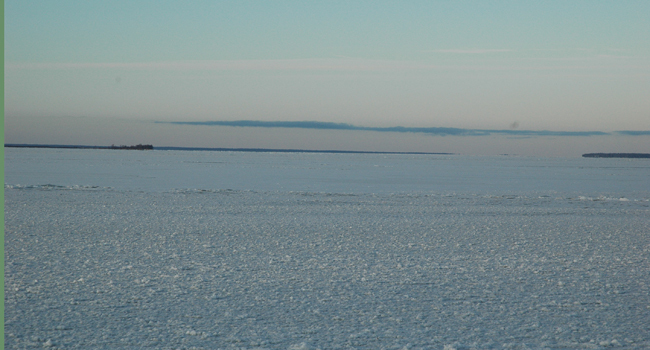 Heavy traffic and a small ice ridge at the landing will complicate getting larger rigs on to the ice. Small rigs or snowmobiles should still be okay though. More good news is that there are a number of resort and ice house rental operators who already have or soon will have plowed access roads available. Most of them have geared their opening dates(s) to be ready immediately after Christmas. I began working on a full list and I'll get that posted as soon as it's complete, in the meantime, here are some of the ice fishing access roads available. Hey, I hope everyone has a great day today. For me, I realized that I have one more afternoon free, so I'm going to hit the lake and try to catch a few fish. The weather should be perfect, so if you can break away, look for me out there. Ice Fishing Report December 22, 2010 Ice Conditions: Hey, Tuesday's snowfall turned out to be one of those beautiful times where the weather was friendly, like a soft voice. Not much wind, warm temperatures and a fresh blanket of pure white! It was perfect for taking a little mid-day break with Annalee so that we could take the horses for a walk. Unfortunately, for the rest of the day, moving the snow was a little more time consuming than I thought it would be. I started plowing in the morning at 7:15 or so and except for our break to ride, it just sort of kept me busy on and off for most of the rest of the day. Most folks around the area spent their day doing the same thing, so fishing reports were few and far between and I never wrapped up in time to get to the lake myself either. Still, good ice conditions are reported from nearly every lake in the area, but the snow will complicate things a little. It was nice getting around on the lakes while we could, but now we're going to become more dependent on the operators who are plowing roads. With Christmas coming up, I'd expect the traffic to be a little lighter for the next couple of days and right now, most everyone that wants to fish, has a good idea about where they're going. Since fishing conditions aren't likely to change much before the weekend, I'm going to skip over some of the fish reporting for a couple of days and spend my time focusing on a project to let you know where the plowed roads and winter lodging opportunities exist in the Itasca area. Highlights from Tuesday; Red Lake, Chad Benson reports that Walleye action has been getting more consistent. Anglers still have the best action during morning and late afternoon, but more fish are starting to come in after dark as well. Lake Winnie, Perch action is picking up back in Tamarack Bay. Look for Perch in the 12 to 16 foot depth range. 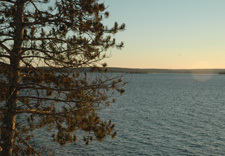 Leech Lake, Walker Bay Walleye action has been consistent, Crappies in Shingobee Bay are cooperative and so are panfish on several of the smaller lakes in the area West of leech Lake. Our weather forecast for today calls for light winds and fairly warm temperatures again. Unless something goes wrong, I should be able to get out on the lake this afternoon. Tomorrow, I'll have some information about road accesses and snow conditions. Hey, One final thought. This Christmas, try to remember; People may soon soon forget your presents, but they will always remember your presence. Ice Fishing Report December 21, 2010 Ice Conditions: Monday afternoon and over night, most areas in Minnesota received at least some snowfall. Luckily for us in the Deer River area, we missed out on the heaviest part of the storm, but even here, I can see that I'll be busy plowing snow for a at least few hours this morning. Ice conditions were already good on nearly every lake, so this snow shouldn't have any major impact on the ice in terms of causing slush or heavy drifting. 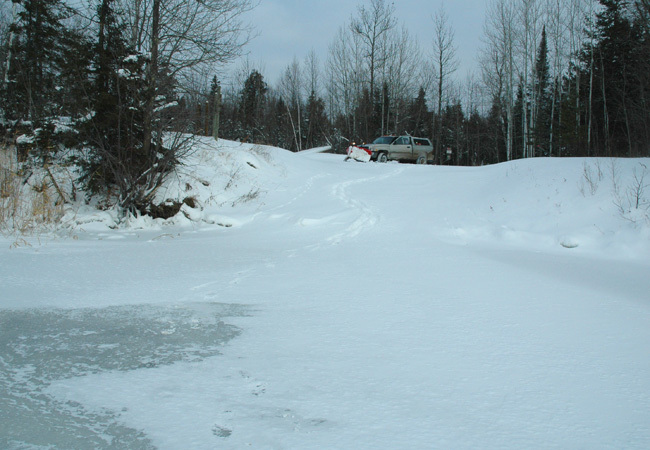 Access roads into some of the smaller, more remote lakes may be affected because these roads are rarely plowed. I'll get an update about that as I travel around this morning. As I've already mentioned in the past few reports, panfish have become the hot topic of conversation locally. Crappies and Sunfish are more cooperative now than they were a few days ago and I've been talking to folks who are catching fish easily right now. Until yesterday, most of the reports were coming in from lakes located to the West and North of Deer River. But yesterday, some information started trickling in about the Crappie action on three of the lakes located Southeast of Grand Rapids. Most anglers that fish the deepest water holes (28 to 35 feet) are catching mainly Crappies. Some of the anglers getting a more mixed bag are doing so by fishing a little shallower, up on the flats in 22 to 26 feet of water. I know we've got a busy weekend coming up, but these things have a way of slipping through your fingers. If you're one of the lucky ones who can break away for an afternoon during the week, now is the time to do it. Walleye and Northern Pike reports didn't improve much on Monday, except for one report that lake Lake Vermillion has been going strong. Over there, Walleyes have been caught on the reefs in the 30 foot range. Jigging spoons tipped with part of a minnow are working well, so are live minnows fished on a plain hook. 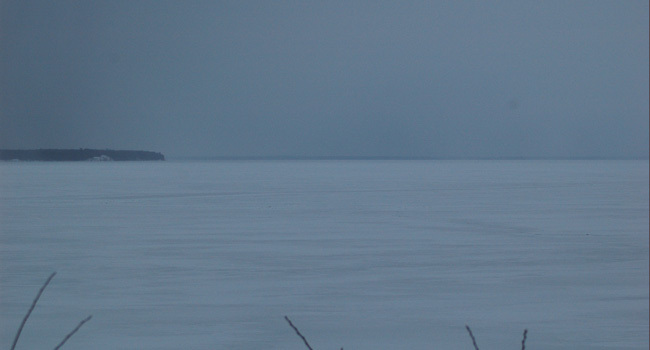 There are plowed roads out on to the lake now and they report 15 inches of more of good ice. Hey, guess what, today is the soltace, the shortest day of the year! Starting tomorrow, the days get longer as we head back toward spring again. So there ya go, winter is almost over already. That wasn't bad at all, was it? I'll pop in a few more details later on today after I get done moving snow,. But from what i can see right now, if you had planned to fish today, nothing should stop you. The forecast is for less than an inch for the rest of today and winds under 10 MPH from the East. I'm hoping to get out myself later this afternoon, so if some weather problem stops me, I'll get it posted before then. Ice Fishing Report December 20, 2010 Ice Conditions: Judging by the traffic on the lakes this weekend, it looks like anyone who wanted to be on the ice, found the time to do it. We traveled to Minneapolis for family Christmas gatherings, so I missed out on all of the commotion, but in many ways, just sightseeing along the drive home was enough to tell me a lot about what's going on. MilleLacs lake (West side) is filling up fast with rental houses and some private ones too. Many of the popular spots already have 20 or more ice shacks set up. On our drive through, it was kind of a foggy, snowy mix so seeing a long way out onto the lake was hard. But the spots within a couple of miles of shore were visible and we could easily see that many of the ice shacks had vehicles parked by them. Some of the operators are plowing roads, but not all of them and since they currently have more snow than we do, I think you'll need to use one of the plowed roads to get on and off the lake. We saw four young men that had tried to go out from an un-plowed access; they were pushing their vehicle out of a snow bank at the time. Nick Perkkio reported in from the Duluth area that he had taken his permanent fish house out on Grand lake in Duluth last Friday. He reported 14 inches of ice and said that there were several full size trucks on the lake over there already. There are some problems though, when you get further out on the lake, you'll encounter some deeper snow drifts, so travel by truck is going to be limited to "well traveled" locations. Leech Lake My embedded journalist over on Leech sent me a message yesterday that the lake now has truck traffic on it as well. 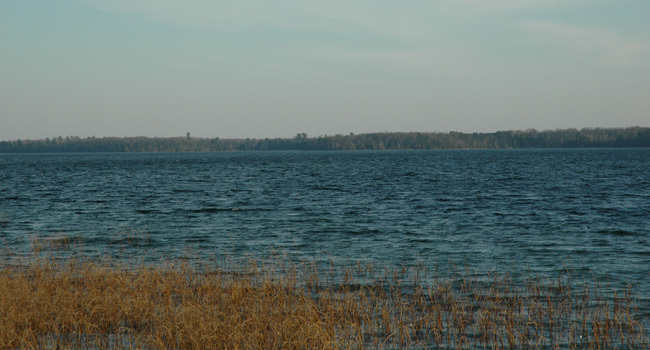 So far, fishing reports from Leech lake haven't started trickling in, but now that folks can get around, the good areas will emerge and we'll start getting more chatter from over there. 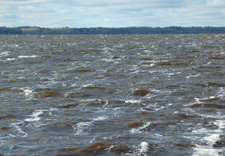 Lake Winnie Walleye reports weren't really too great from this weekend. Most of the anglers were reporting the action as slow but not horrible. There were some eater size fish coming in and some larger slot fish as well. Ice conditions are still excellent with ice thickness of 15 inches reported. There are now full size trucks towing the larger "wheel houses" out there. 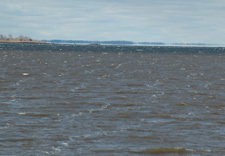 Red Lake fishing reports sound pretty good, but the guys on the North end are having some trouble with snow drifts. Under the deeper snow, ice is not forming as fast as the more open areas on the South end. Fishing close to the shoreline isn't too bad right now, but if you like getting out into mid lake, it might be delayed for a while. Guys on the South end of the lake are towing out the big houses now, but they too are not going very far out into the main lake. You'll be able to find a place to fish, but if one of the operators tells you to stay away from certain areas, you better listen. Crappie and Sunfish action made the best news over the weekend. Almost everyone who spends time fishing for panfish, is catching some of them right now. Not many anglers were reporting limits, but quite a few folks had something on the order of 8 to 10 Crappies and another dozen Sunfish, maybe even a few Perch thrown in. Fishing in 24 to 30 feet and mixing your baits will improve the odds of catching a "mixed bag". 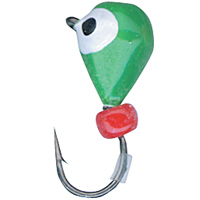 Try setting up one line for Crappies with a Demon or similar ice blade type of bait, tip this one with a minnow. Set the second line up with a smaller, bug type bait and tip this one with a couple of wax worms or grubs. Hey, It sounds like we could have another major snowfall heading our way. I'll try to get out ahead of it today to see what else we have developing. If you have comments, don't be shy to send them. Have a great day! Ice Fishing Report December 18, 2010 Ice Conditions : For me, Friday became a day of shlepping back and forth to Grand Rapids trying to get my main computer working. At one point, all I wanted to do was go back to the old days of scribbling notes and pinning them up on a bulletin board. The computer is going to be in the shop for a few days, so using my old system will limit me a little and the reports will be shorter than average until I'm back up and running. Luckily, I was able to get home just in time to get outside and have my walk for a while before dark. I made a quick run out into the field to share some special winter treats that I had saved for the Deer. I got out late, so there were already some visitors when I arrived. They were just like kids waiting to open gifts and by the time I got everything where I wanted it, they were already looking out from the inside edges of the trees. Hey, don't worry, I saved plenty for us too, but it is Christmas ya know? 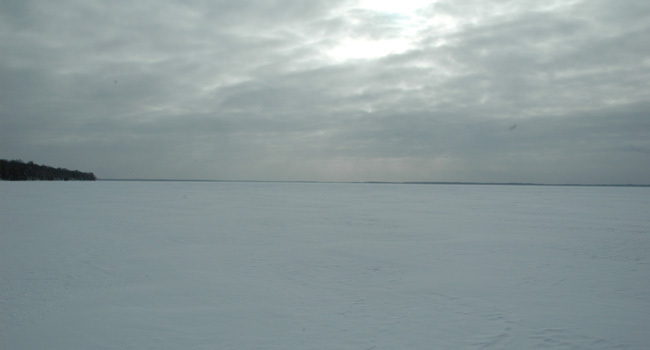 In terms of fishing, Friday was sort of an un-inviting day on the ice. Not frigid, but cold and there was a new bite in the air thanks to the windy, cloudy conditions that moved in. Light snow fell at times all day and all night, so we have about an inch or so of new, fluffy white snow this morning. There was an increase in traffic at Fred's Bait shop yesterday, mostly local traffic, but there are more visiting anglers coming in too. A lot of the traffic is heading North toward Lake of the Woods, some of it heading toward Red Lake and the rest scattered around throughout the area. Local anglers were reporting an increase in the Northern Pike activity, maybe thanks to the cloudy weather. One of the local guys had gotten his limit of 3 fish, one of them 30 inches and the other two in the high 20 inch range. There were some good reports about Pike coming in from Cass Lake too. Crappies have been the most consistent during the past few days though. I ran into a friend of mine yesterday who told me that he'd been catching limits fairly easily. He's been using a #12 Ratfinkee, tipped with a wax worm or a single Euro Larvae. I had great luck using these last season myself, but remember to use really light line if you want them to work. Two pound test will make a great difference and as long as you remember not to force fish in too fast, it's stronger than you think. 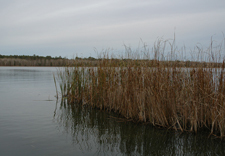 Crappie location has been typical for early winter, open water areas in or near the deep holes. Softer bottom areas will be more prdictive than sand or rock, but fish with gather on structure like brush, deep weeds or even inside corners near the shoreline. 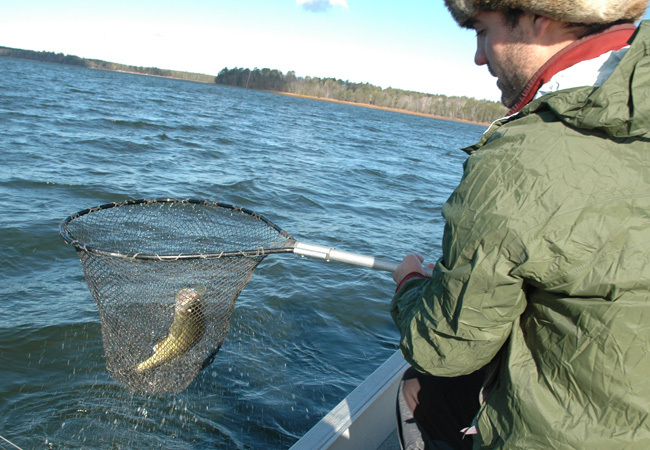 Perch action on lake Winnie is good, but the size has been small so far. Most of the action has been in shallower areas near shore, 10 to 16 feet of water. Walleye anglers are still talking about the main lake bars and humps on Winnibigoshish and while everyone heads out this weekend on ATV's, I hear a rumor that there will be some road plowing staring up very soon. I'll get more info on that for next time. I'll need to take one day off from the reports so I can go down and spend Christmas with family in the Minneapolis area, so there won't be anything new on Sunday. Have a fantastic weekend! Ice Fishing Report December 17, 2010 Ice Conditions : Thursday was another fantastic day around the Deer River area. Not really warm, but the sun was out and the winds were calm for most of the day. I spent my morning getting the 4 wheeler put back together and thawing out all of the fishing gear that was iced up from the last trip. By about 2:00 PM I had it all together and started heading toward Big Winnie for a trip out to the middle and hopefully some good Walleye action. Everything went well except for the Walleye action. When I arrived at The Birches Landing on the East side of Winnie, it was packed with vehicles. So far, no one has attempted driving out on to the lake from there, but it's going to happen any minute. The ice conditions are good, with at least a foot of solid ice and very little snow cover. We ran out about 3 miles on ATV's and as soon as we drilled the first hole, we wondered if we should have just driven out ourselves. So far, there wasn't any big ice ridges in this area to worry about, but there are a coule of rough patchs of ice. We were able to steer clear of these for now, but keep an eye open as you head West from Tamarack Point. Since most of the traffic was heading in the same general directon, I wanted to go a different direction and try to find a spot that hadn't been fished yet. Our whole trip was based on finding one spot to set up for that "magic evening run". Since it only lasts for about 45 minutes, it's hard to know until afterward whether it works or not. I'm not sure which variable I got wrong, but we didn't get much action. I had picked two humps that hadn't been fished at all this winter and we drilled holes anywhere from 30 feet deep up to the tops at about 24 feet. We saw fish on the flashers, but had a really hard time getting any to strike. It's possible that we just didn't get the presentation right because there were several instances when Ii was sure that I had fish ready to hit, only to watch them disappear from the flasher. I had tried several baits including Buckshot Spoons, Puppet Minnows and Jigging Shad Raps. For what it's worth, the only action we did have came on the bait that Arne was using which was a Lindy Techniglo Frostee. Hey, sometimes the plan just doesn't come together, it's okay. Even "almost connecting" is still good and it will just make the next time even better. Oh by the way, I'm not supposed to mention that Bill Powell caught an eelpout, so please try to forget that you read this. Northern Pike dark house anglers are getting a few fish, but lots of them are frustrated by the water conditions. Murky water still persists at Third River and on Bowen's Flat. I talked with a friend yesterday who had tried to beat the problem by moving to a clear water lake. Now he reports seeing more fish, but much less quality size. He did report that one of the popular ice fishing lakes located just North of Cohasset, already has vehicle traffic on it. According to the forecast for the weekend, if we get any snow, it will be really light. With a week to go before Christmas, this will be one of your best chances to get out on the ice while conditions are excellent. Ice Fishing Report December 16, 2010 Ice Report: Oh man, what a nice day Wednesday was. Lots of sunshine, warmer temperatures and the winds were fairly light. It proves the theory that if you spend a few days in -10 degree temperatures, 15 degrees and sunshine will seem like a heat wave. As you'd expect, traffic is really picking up and by this weekend, anyone who wants to be fishing will have plenty of opportunity to choose from. Today (Thurs), the main road heading out of the gap at Lake of the Woods will be open to un-restricted vehicle travel. The guys up there are reporting ice thickness upwards of 15 inches and improving daily. Walleye action is spotty though, some folks are doing really well, while others struggle. For what it's worth, the anglers catching the most Walleyes are fishing deeper than usual for this time of year. Now that you can move around, it might be worth your time to get out away from the crowds sand try the 26 to 28 foot depths. The Red Lake ice reports are good too. My buddy Chad Benson reports that his anglers are catching an average of 10-20 Walleyes per day. Action has been on and off throughout the day with a little improvement at dusk. The depth of ice on Red is around a foot right now and even though the guides and resorters aren't giving the green light, there is already significant truck traffiic on the lake and there are lots of fish houses popping up out there. This weekend will be a full scale ice fishing opener on Upper Red. Lake Winnie Walleye action is good, so far most everyone is talking about fishing the main lake humps and bars, but there's a decent weedline bit going on right now too. Key depths are 7 to 10 feet on the shoreline and 22 to 26 feet out in the mid-lake areas. So far, everyone has avoided getting out on to the main lake with vehicles, but with ice reports of almost a foot out there, it's only going to be a few days before we see the first trucks and large houses popping up out there. Darkhouse anglers are reporting trouble seeing Northern Pike because of cloudy water conditions. I think this affecting the folks up at Third River and out on Bowen's Flats the most. The water on the West side near the Mississippi River entrance have a little better conditions. As the high water recedes, water conditions should begin to clear up. Most of the panfish anglers in the area have "favorite spots" to start out the ice fishing season and from the reports coming in, everyone is getting fair to good action on both Sunfish and Crappies. Smaller lakes that don't get fished hard in the summer are all going to be good for a couple of weeks. The only problem right now is that some of the roads further back in the woods have enough snow on them to cause trouble for the folks with smaller vehicles. If you're thinking about it, make sure you go with a buddy who has a decent 4 X 4 or snowmobile. Cass Lake action for Walleye has started to pick up on the breaklines back in Allen Bay. Ice thickness of 10 to 12 inches are reported. So far, no vehicle traffic that I know of and I'd guess it will be another week before many folks would want to venture out onto the main lake over the deep water. Later today, we'll be heading out for a Walleye and Perch combo trip. We haven't really decided where we'll be heading, but I'd guess that it will be either Winnibigosh or Leech. I'm hoping for one nice day out there to get some good pictures and maybe even gather a fish fry. I'll let you know how it goes. Ice Fishing Report December 15, 2010 Ice Report: On Tuesday, the cold weather turned a bad day of work into a good day of fishing. I got a call from a man who was supposed to be working on a cell tower project on the western edge of Lake Winnibigoshish. Due to the sub-zero temperatures, the concrete work had to be called off, so what better to do with some free time than go fishing, right? So we planned our trip for early morning, just in case the day warmed up and he would happen to get called back to work later in the day. When we met at Fred's Bait in Deer River, it was 13 degrees below zero, still pictch dark and I was wondering if I needed to get my head examined! Our main goal was to catch some Perch, but we would have been happy catching most anything. The problem was that we're still not quite ready to drive on the lakes, so we needed a spot that we could walk to. To avoid having too long a walk ahead of us, I decided to take a crack at one of the shoreline area on Cutfoot Sioux. That way we'd have a shorter walk and we could fish for Perch, Walleye and panfish, all options open. It was just beginning to get light when we arrived, but we could see that there were some tire tracks going out on to the ice. Hmmm...I was really tempted to go ahead and drive out, but just to play it safe, we stuck with the plan and hoofed it. Along the way we found several chunks of ice that had been cut by dark house anglers who had been spearing Northern Pike over the weekend. I sized one up and found that it was 9-1/2 inches thick. Add an inch or two for the time that's passed since they cut those holes and we're probably looking at almost a foot of ice right now. I might have been okay driving out there, but dragging the Otter sled with the the gear inside wasn't really a hard trip. It only took ten or fifteen minutes to get the first holes drilled and we were ready to get started. At first light, we could see a lot of "lookers" on the flashers, but getting them to bite was really tricky. They might have been finicky Walleyes or maybe they were Perch that hadn't had their morning coffee, either way fishing was slow for about an hour. Just about 9:00 AM the Perch started kicking in to high gear and it was obvious that they were moving around a lot. One hole would be hot for 3 or 4 fish, then another and so on. There were alot of small fish, but we caught and sorted enough of them that I was able to send Chris home with just shy of his limit. Best depths were 7 to 10 feet of water and the better baits were 1/8 ounce "Buckshot Rattle Spoons, tipped with a minnow head, Demons with either a minnow or a couple of Wax worms or the small size Jigging Rapala. Keeper size fish were responding best to baits lifted a foot or two above them. The better size fish would come up to grab the rising baits. If we fished too close to the bottom, smaller fish were almost all we could get. On the way home, I took a detour to check out the conditions up at Bowen's on Winnie. There are another half dozen new houses out there since last weekend and now there were several trucks parked out on the ice, over shallow water. There was one driver who was braver than the rest and he parked his rig about a block out from shore. In another day or two, we'll see vehicle traffic start to pick up as anglers get more comfortable with the ice. Hey, lots to see, lots to do. If you can't make it out for a while, just check in here and we'll keep you up to speed on what's going on out there. Ice Fishing Report December 13, 2010 Ice Report: Hey, sorry that the pesky weather messed up so many plans this weekend. I know that there were lots of high hopes and success stories being rehearsed, just waiting to be told. On this particular occasion, the jet stream decided to drift South of the Grand Rapids area and deliver the worst weather to the mid-section of the country, so we got the cold temperatures, but not a snowflake fell here on Saturday or Sunday. In fact, Sunday was picture perfect, not a cloud in the sky and light winds, another great circumstance for making ice. It was a little chilly though and the low temperatures kept lots of the local anglers cooped up for another weekend. 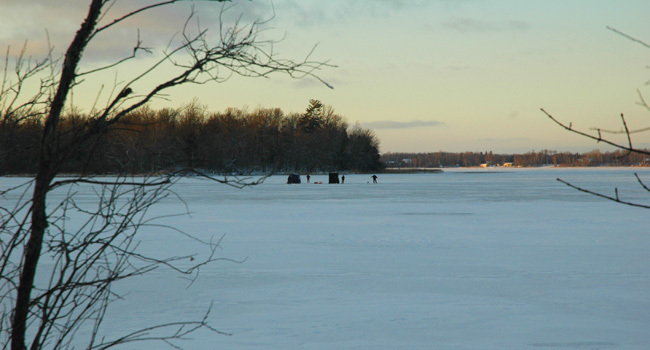 Some fresh ice fishing reports from new lakes started drifting in as anglers realize that there's good ice now. On Cass Lake and Pike Bay , folks have gotten quite a few dark houses out on to the lakes and Northern Pike action has been fair. Nice size fish are being reported, but not many numbers. Some of the guys are talking about the cold front causing a slow down, we'll see later this week as the weather begins to moderate. Lake Vermillion has good ice now with many areas approaching ice depths of nearly a foot. They already have some pressure ridges forming, so you'll need to check in with some of the local operators for routes around the ridges as they develop. Anglers on Vermillion are mainly targeting Walleyes for now and catching fish on the deeper breaks in 22 to 28 feet of water. Some quality size Northern Pike are being taken by spear fishing there too, but again, not lots of numbers. Walleye action on Lake Winnie, out around the mid lake bars and humps continues to be good, but so far, you'll still need a snowmobile or ATV to get out there. It wouldn't surprise me at all to start hearing about some vehicle traffic and big fish houses out there within a week or so, but not just yet. I have to give credit to the guys who took that ride on ATV's yesterday, that is one cold way to catch a fish! Hoofing it to a smaller lake and fishing for panfish might be a better way to go for a few more days. You get warm on the walk out and both Bluegills and Crappies are cooperative right now. There's mixed reports about the depths though, one group caught Bluegills in 24 feet of water and another caught them in 8 to 10 feet on the weed edges. Crappies are typically a little deeper and have been coming from 24 to 30 feet depending on the lake. If I was a real man, I would have gone out and sat on the ice yesterday, but for me, the allure of sitting in a nice warm, heated deer stand with my daughter sounded better. So after we did a little cooking together, we grabbed the camera and headed out to the farm to sit and watch. For us, it's a treat to see Deer because during the main part of the hunting season they don't come out until after dark. I think the bucks are still nocturnal because we haven't seen an antler all week. Lucky for me, some of the does made an appearance to keep it interesting for Katie. 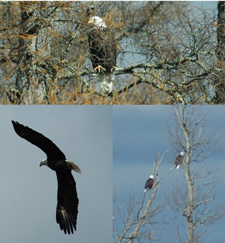 We saw 10 for sure and may have missed a couple inside the treeline, good enough for us! Ice Fishing Report December 12, 2010 Ice Report: The anticipated cold snap blew in on Saturday and while it brought blizard conditions to much of the Southern half of Minnesota, for now, the Deer River area was spared any more snow. Windy conditions still made it a chore for the folks who wanted to get out on the ice, but there was some traffic and most of the anglers who ventured out were rewarded for the effort. Ice conditions are generally good almost everywhere now and with temperatures like we have this morning ( -13 degrees ), we'll see ice thickness increase an inch or so every day for a while. The only complication right now is the drifting caused by yesterday's wind. Shoreline areas will be a little tricky until traffic or plows help get the landings packed down, but once you get out onto open ice, travel won't be bad at all. Crappie fishing was good for Steve Arbor on Saturday, he and a friend reported that in spite of the cold wind, they were able to catch their limit of Crappies in less than two hours. On another lake, Bill and Dave Donnelly reported that they captured 15 really nice Bluegills using small jigs tipped with Wax Worms. It's a safe bet that the early panfish bite is going right now on your favorite lake too. 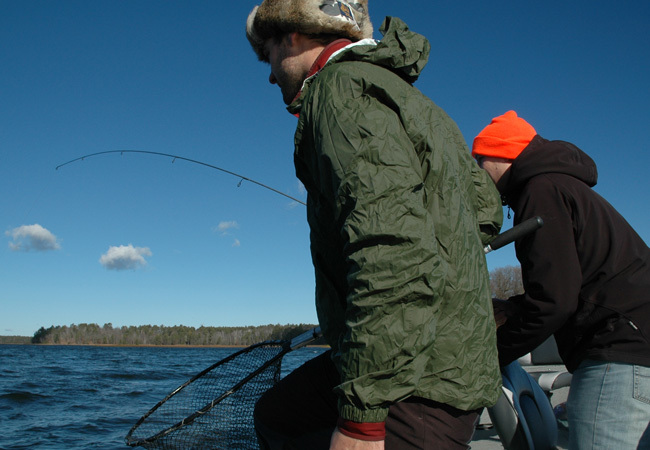 The best bet for first ice panfish is to pick up where you left off during the late fall. Deep water holes with a softer bottom will hold plenty of food to attract panfish, these areas will be productive until the Oxygen levels start dropping later this winter. I got an update on the Walleye action at Lake of the Woods from Matt Mattson and while it had slowed down since Friday, they still managed to catch a dozen or so more Walleyes on Saturday. The consensus among the resort operators and guides up there was that the weather change had thrown off the bite for a while. Ice conditions on Upper Red Lake continue to improve and most of the slush has cleared up. If there isn't a ton of new snow during the week, there will be roads open to small vehicles within the next week. Likewise, there will be ice shack rentals out there within the week as well. Walleye action has been spotty up there, but there are enough fish coming in tp make it worth the trip. 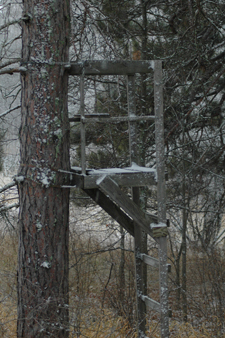 Hey, I mentioned yesterday that I might sit in my Deer stand with the camera for a while. With the cold wind blowing I wasn't too sure what I'd see, but it wound up being a great evening. In the past week, I still haven't spotted any bucks, but the does are active and at one point I had 8 of them around my stand. All together I guess I saw about a dozen, I know I could just put out a trail camera, but there's just something nice about seeing them and the quiet, snowy woods are just gorgeous right now. Ice Fishing Report December 11, 2010 Ice Report: As far as winter days are concerned, Friday was about as nice as it gets. The air temperature never made it above the mid-teens, but the sun was shining and the wind was calm. As a bonus, I was treated to a great sunrise and a great sunset both in the same day. While I was working on the computer on Friday, I got a phone call from my pal Matt Mattson who was sitting in one of Wig Wam's ice shack rentals up on Lake of the Woods. He reported that the Walleyes were biting up there and told me that he had just landed a 31-1/2 inch Walleye. Very cool, but expensive, now he's on his way to the taxidermist to get his trophy mounted. Matt was catching the fish in about 24 feet of water using a White (glow in the dark) Demon tipped with a minnow. He commented that the fishing action was steady, not fast and furious, but enough action to keep it interesting. They had a foot of ice out on the lake, but places in the river are still thin, 6 to 7 inches. Anglers are going out to the rentals on resort shuttles and no one expects to see vehicles on the lake for about another week. On my afternoon tour, I decided to make a run up to Highbanks Resort where I expected to find Rick hustling around getting rental ice shacks out on to Lake Winnie, but when I got there, the place was quiet. So far, they do not have rentals on the ice or any roads plowed. From their dock, I could see several protables set up out on the east humps, probably targeting Walleyes. According to Bill Powell at Fred's Bait in Deer River, Walleye action on the mid lake structures has been good for the folks who are out there. Travel carefully though, from the snow and wind on Thursday, the East shoreline of Winnibigoshish is drifted in, it's probably easier to get out there with a snowmobile than an ATV, but once you're past the drifted snow near shore, the ATV's would be fine. I called the folks at Nodak's on the South shore of Lake Winnie and they reported that they have 14 dark houses ( all rented for the weekend ) out on the West side of the lake and a couple of houses going out in front of the resort now too. They didn't give me a date that they'd start plowing roads, but it won't be long now. I made one last stop, a swing in to Ball Club Lake, which has a lot of deep water and is known as a late freezing lake. There are a handful of ice shacks out there now too, but it's not crowded yet. I think most everyone out there so far has been targeting Northern Pike, I will try to get a report about that today. Hey, for the few of you who are still out Deer hunting this weekend, good luck and be sure to keep warm. We'll see how the weather breaks today and if it's not too windy, I may even go sit in the stand with my camera just for fun. Ice Fishing Report December 10, 2010 Ice Report: Well, hmm...now we've got good ice, but the weather could cause a few problems. According to the NOAA forecast this morning (friday), it sounds like there's an opportunity to squeeze in a fishing trip today and/or early Saturday before the weather takes a turn for the worse. Cold temperatures aren't to tough to handle if the winds are light, and for today they predict less than 10 MPH. Saturday evening and Sunday might get a little rough out on the ice if we get the -20 degree temps and high winds that they're predicting. The good news is that we'll have even better ice conditions after this cold snap passes. If you've got a good shelter and plan to venture out in spite of the weather, Lake Winnie has started to produce some good catches of Walleye, Perch and Norhtern Pike. Some anglers are already heading for the mid-lake bars and humps to catch their fish, but there's a good bit of action in the shallow water too. For me, I'd stick to the shallows for a while, just because it's more convenient. The weed edges are holding Pike and Perch during the daytime and there's a short run of Walleyes just before sunset until about 5 :30 PM. I haven't been able to get a really good report from Leech Lake because there isn't that much traffic over there yet, but I do know that Leech has good ice cover, 9 to 11 inches on the main lake and there's a decent evening Walleye bite in the Stony Point area. I've heard that the Crappie anglers are out on Shingobee and I'll try to get a report on the action out there. So far, I've not heard a Perch report. Red Lake Walleye action is good, but spotty. Some anglers are having great fishing, but there are also a number of them that have been struggling to find the right spot. Almost everyone is getting some fish though, so it's worth the trouble to do some scouting. So far, no one has gone out with a pickup truck, but ATV's and Snowmobiles are okay. Light vehicles like the Trackers, etc...are okay near shore, but don't trust the ice out deeper just yet. Locally, ice shacks are starting to pop up and lots of the smaller lakes now and the Crappie action has been okay, but not stellar. At this point, most any of the small lakes are ready for ATV's and Snowmobiles, so getting to your favorite Crappie hole should not be a problem. Hey, I mentioned that I had an invitation to do some late season muzzleloader hunting on Thursday and in spite of the semi-crummy weather in the morning, we did make it out. Even though it was blustery, the Deer were moving a little and we wound up spotting a total of 14 between the two of us. There was quite a bit of new snow and the wind was drifting the roads shut quickly, so I was concerned about getting around. Fortunately, my buddy had a nice Red Jeep that really made a huge impression on me, it got us through everywhere and I know we went through snow that I'd never even try with my truck. Neither of us bagged a Deer, but we each had some really close opportunities and with a slight adjustment here or there, we may easily have gotten one. I don't think I'll fish today, but I'll probably take an afternoon tour again to see what's developing around the area. So far, fishing information is coming in slowly, but things are definitely starting to happen, so stay tuned in. Ice Fishing Report December 9, 2010 Ice Report: Well, we made it up to Cutfoot Sioux for our official first ice fishing trip of the season. When I arrived, I discovered that there had been a few changes since my visit on Monday. That day there were no rigs anywhere to be seen, but by today there were a half dozen groups fishing and another group that had just finished up and were already heading home. The ice conditions are good, with at least 7 inches of clear ice and only about an inch of snow on top. We walked out to our fishing spot because earlier in the day I'd decided not to trailer the 4-wheeler. But had I brought it along, we could have easily used it. Most of the other ice fishermen on the lake were using ATV's, the snow is a little thin for snowmobiles, but they would be okay too. WE probably relied a lttle too much on what was last year's hot spot and didn't allow a lot of extra time for moving around. I drilled maybe 20 to 25 holes on a weedy point that had been a good producer last winter. The action wasn't great, but we did catch a few Perch, a keeper Walleye and I broke off three fish at the hole. I guess I forgot over the summer that you can't horse 'em in with 2 pound test line. The Walleyes I lost weren't huge, they were "in the slot" at around 20 inches and would have at least given me some new photos. I don't blame myself for losing the Pike, he just did what Pike do and cut my line with his teeth. We saw several other fish on the flashers too, but these lookers were hard to trick and very few of them ever struck. The evening run that we'd counted on, just sort of fizzled out without ever getting up a head of steam. While we were out there, I talked with Chad Benson up on Upper Red Lake. He now has his road "roughed in" and has plans to start placing his fish houses out there next week. He plans on being open for business by Wednesday. They've done some fishing already and he reported that there's kind of a lazy, on and off bite throughout the entire day. By the way, I heard a second hand report that there are some light vehicles out there already. The operators on Lake of the Woods are almost all open for business now and they're talking about enough ice for vehicle traffic within the next few days. Fishing action up there is good, not terrific and most of the anglers are out in the 18 to 24 foot depth range. Hey, I know that I keep saying that the Deer season is over for me, but today I just have to go one more time. A friend invited me along to hunt in some really special "hill country" where they stalk the deer and search for them in beds like the hunters out west do. I've never done anything like that and so I'm kind of excited, I'll brave the cold temperatures to see if we can spot a few. For the weekend, I guess we'll start seeing some serious traffic out there now. The cold snap they're predicting will be a problem fo some of us who prefer to stand on the ice, but for anyone with a nice warm shack, there will be plenty of ice to get set up really soon. Ice Fishing Report December 8, 2010 Ice Report: Okay folks, Conditions for making ice couldn't have been better during the past three or four days! Tuesday was just such a nice day that I had to get out for one last "ice conditions" tour of the area. I've already said that if you want to get out and ice fish, you can. So the only new news is that now even the deep, late freezing lakes are completely ice covered. Except for maybe a couple of the really deep, Lake Trout lakes to the East of Grand Rapids, I can't find anything that isn't ice covered now. Thanks to the light snow cover and cold temperatures, the new ice on these deeper lakes is really solid, clear and there's only a half inch of snow on the surface. In fact, I wish I'd brought my skates! I was easily able to walk around without hearing any groaning, cracking or splitting. Today, (Wednesday) we'll be taking the afternoon to head out and try our luck and I hope to have a fish picture or two by tommorow. Conditions are good enough now that I'd excpect that this weekend, we'll see lots of hard water anglers out on the lakes. Hey, with everyone scurrying around to get ready for fishing, the phone contacts weren't too great on Tuesday. I'll try to make up for today's short report on Thursday morning. Ice Fishing Report December 7, 2010 Ice Report: On Monday we got a touch of new snow, but except for causing a gloomy day, nothing that will hurt the ice from progressing. 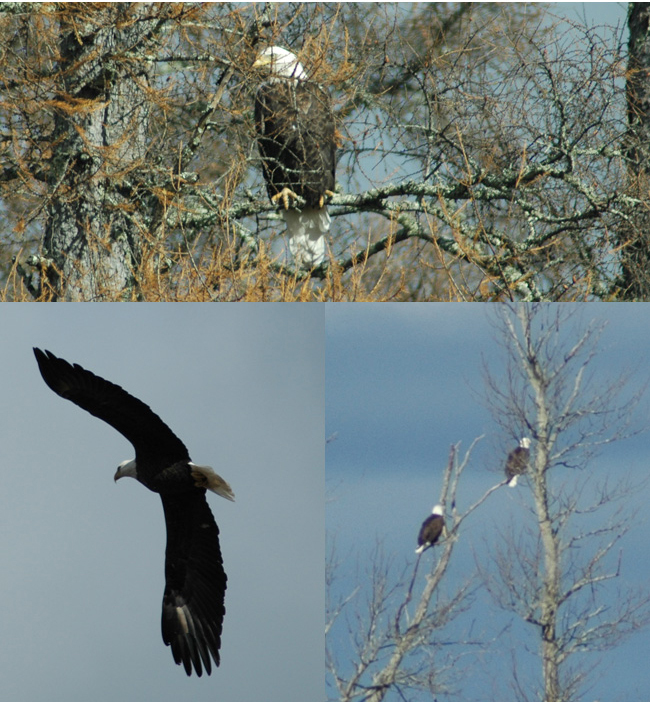 It was evident on my afternoon drive that there are more anglers driving around and checking the landings. There are a few new houses showing up on popular spots, but I was surprised at how few there were. The area on Bowen's Flats just outside of the gap between Lake Winnie and Cutfoot Sioux is now populated with about a half dozen ice shacks, but that's it so far. There was an ATV parked along side one of the shacks and it looked like travel conditions are good in this area. There was also one shack placed further east into Tamarack Bay and a couple of anglers down in the area along Plughat Point. I got a pretty good look at the main lake and I don't think anyone has ventured out onto the main lake humps or bars just yet. After I snapped a few photos in that area, I drove into the landing near Williams Narrows on Cutfoot . Judging by the tracks, there have been lots of folks checking it out and even a couple of snow machines out there, but so far, no activity. Around the corner into McAvity Bay, there was one lone ice house located over deep water in the center of the bay. I asked Chad Benson for an update about Upper Red Lake and they are currently working on preparing a road out onto the lake. On Monday, they pulled a drag down the access road to smooth it out. They also drug the first 300 yards out on the lake. Chad says that there was still some slush pockets in the first 300 yards, but everything out further looked good. Their plan for Tuesday is to head up again, stake out roads and maybe even do some Walleye fishing. Hey, on Monday I was bound and determined to find some uplifting things to photograph, but the weather was so gray that I just couldn't get what I wanted. It's kind of ironic because I actually saw more wildlife than usual, I have seen a lot of does during the past few days, tons of Eagles and who knows how many small birds. I can hardly wait for the next sunny day so that I can get some better shots. Today, I'll be packing up all of my gear, getting ready for my official ice opener tomorrow (Wednesday). I'm hoping to have some fish pictures on Thursday morning. 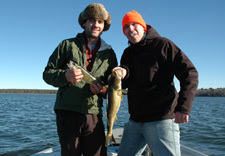 Ice Fishing Report December 6, 2010 Ice Report: More ice, more anglers, more fish? On Sunday, as we moved from one Deer hunting area to another, we stopped in to check out several lakes. Most of the lakes we looked at were small, but every one of them now had enough ice to support anglers walking and some were really close to being ready for ATV travel. We spotted a familiar truck parked at one of the landings and stopped to pay some friends a visit. The slush on top of the ice was now frozen solid and it was easy traveling as we walked out onto one lake to talk with Bill and Chester Powell. They where just getting set up to try for some Pike in their dark house and hadn't started fishing yet, but we could see that the setup was going well. The ice was about six inches thick, clear and solid. Reports coming in are that conditions on most of the smaller area lakes are similar. There's at least six inches of ice or more and folks are starting to trickle out onto them. For now, avoid going out on the deeper lakes or into the middle sections of larger lakes. But if you're in the mood to get out to ice fish and you don't mind hoofing it, you should be on green for go. I'll be looking at some of the larger lakes today, so watch for more details in the morning. Hey, I'm sure that sooner or later, winter will get old, but right now it's just beautiful out there! With all of the pressure to be everywhere at once during the holidays, try to remember all of the wonder that's just outside your door. Ice Fishing Report December 5, 2010 Ice Report: Okay, if you've been waiting around until you hear that people are out on the ice fishing. PEOPLE ARE OUT ON THE ICE, FISHING, at least on some of it. We managed to escape getting a heavy snowfall yesterday and with the cold air temperatures, ice conditions are going to be improving daily. At this rate, we'll see ice thickness increase by an inch or more every day and by mid-week, the bait shops ought to be seeing a steady increase in traffic flow. My daughter arrived home with her boyfriend in tow and he's hot to bag a buck with his muzzleloader, so we spent more time in the woods than near water. But we did take a quick tour on Saturday morning and found that folks are getting out onto more lakes now and that they're towing more gear on to the ice. On White Oak Lake, we saw four dark houses, an ATV and even a small car parked over shallow water near the landing. 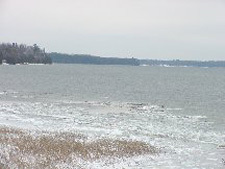 Up on Lake Winnie, ice thickness in shallow water is getting into the 10 inch range, slush is freezing solid and Pike fishing reports are improving. Apparently, the cloudy water that caused problems for the early arrivals, has been clearing up and the pike are moving better now. Expect to see a lot more houses out on the lake during the next few days as folks begin to gain confidence. ATV travel should get good up on the Bowen's Flats area and I'm going to try and swing in there today to see how it looks. Hey, getting back to Deer Hunting for a minute, I think they might be right about Jone-Z being born with a horseshoe or some other good luck charm! Up on our farm, he saw more Deer yesterday than we've seen so far this entire season. He saw a total of nine and I saw two for a total of eleven between us. Since they were all does (until past legal hours), we didn't bag any, but it's sure nice to see 'em once in a while. Today, we're calling in the cavalry, Arne Danielson is going to be the ramrod and direct a few drives this morning before the kids head back toward school. Everyone is asking about the ice conditions, so if you've been out, drop me line and let me know how it's looking in your area, I'm shooting for a trip this week, maybe Wednesday or so, depending on the weather. I hope your day is great! Whether you're fishing or hunting, I'll be hoping to hear an update. Ice Fishing Report December 4, 2010 Ice Report: Okay folks, a couple of days without wind and low temperatures hovering around the zero degree mark are helping to speed up ice production . During the course of this weekend, we'll start seeing some activity on several lakes in the Deer River area and I'm sure that Red Lake and Lake of the Woods will both have Walleye anglers on the ice today. According to Jerry at Rogers Campground on Red Lake, they have enough solid ice already for ATV travel and I mentioned already a few days ago that my buddy Chad Benson had already fished and bagged a couple of Walleyes on the South shore. Jerry made note that the camp ground is not yet open for the winter season, so make sure you have bait before you get there. On Friday, Sportsmen's Lodge on Lake of the Woods announced that their official season start date has now been set for Tuesday December 7th, 2010. They are reporting 6 to 7 inches of ice on some stretches and they think that by Tuesday they'll be finding ice in the 10 to 12 inch range. You know, be careful, but if you're careful, you can probably find some opportunities up there right now. 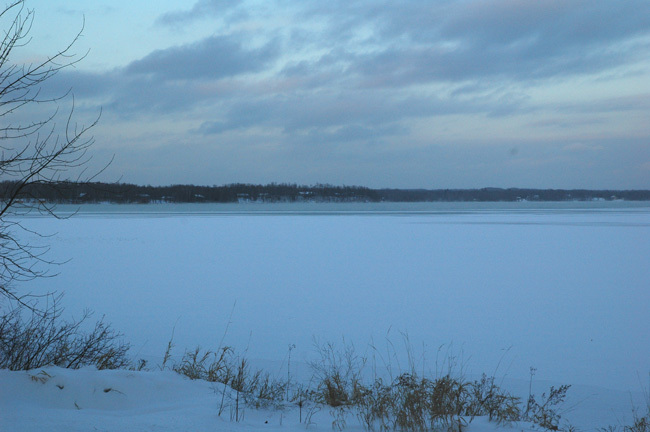 Closer to home, Cass Lake appears to be frozen over now too, at least the area that can be seen from the shoreline. This means that many of the deeper lakes will also be accessible soon. So far, conditions are favorable for these deep lakes to form excellent ice sheets. Lake Winnie now has about six inches for ice cover in most areas around the shoreline as well. So far, hoofing it is the way to go, but I'm predicting that you will see ATV's out there within a day or two. Acoording to my pal, Bill Powell, a mutual friend was on the lake yesterday and fished, but we haven't gotten a report about the results yet. Hey, I wish I could stay in the hunting mode for just a little while longer, but I can feel the next season crowding in already. We might do just a lttle more hunting with the Muzzleloaders this weekend, but I can feel an ice fishing session coming on really soon. If you're still hunting this weekend, good luck! A final thought, I've been doing some housekeeping on the website and if you have the fishing report page bookmarked, you've probably already noticed that the old page has moved to this location. 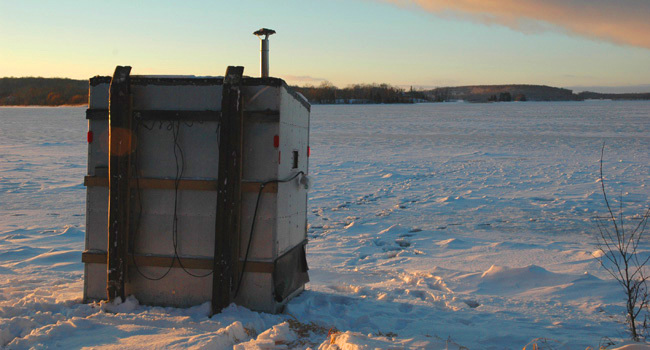 For winter ice fishing reports, bookmark this page and then in the spring, we'll move back to the proevious fishing reports page for summer. Ice Fishing Report December 3, 2010 Ice Report: Things are starting to happen again as the cold snap helps make up for lost time. I was working around home on Thursday when I realized that there was an absolutely gorgeous afternoon developing outside. Hey, It was really hard, but I talked myself into going outside for a little ride to see if the ice conditions were improving. I was glad that I did, because I really found some nice surprises along the way. Listen, I'm not going to name the lakes, because I don't want you going out on ice that's too thin. But heading east from Deer River, I found one of the shallower lakes where a couple of anglers were hoofing it out to their fishing hole with portable shacks in tow. Watching from a distance, I could easily see that they had no trouble walking on top of the water-saturated snow. That's a good sign that the slush problems on some of the lakes will clear up soon. As I got closer to Grand Rapids, I stopped in at one of the deeper lakes in the area, here I still found mostly open water accross the main body of the lake. But, shallow, shoreline areas where the ice had formed last week were frozen solid and I had no trouble walking out on a good (no cracking, moaning or groaning) ice until just before arriving at the breakline to deeper water. Here the water was still open, but a healthy span of new skim ice was forming. At this rate, it won't take long before this bay skims over completely. Since I had gotten kind of a late start and needed to get back home, I didn't drive to any more lakes. 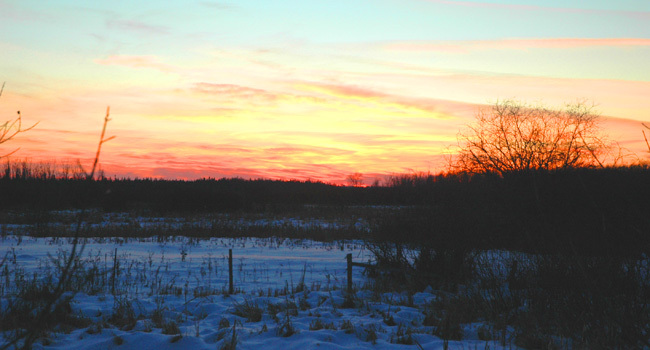 But for the effort, on my way home, I was treated to seeing a half dozen Deer and one of the better sunsets that we've had so far this season. There's a new weather system coming in today, but it sounds like most of the snow may stay well south of us. If we dodge that, it wouldn't surprise me to see some fishing pictures showing up in this report by next week, maybe. Ice Fishing Report December 2, 2010 Ice Report: Maybe we're moving back in the right direction again now, but so far the news isn't good for anglers who were planning to head up this weekend. Calling around the area on Wednesday, it was really hard to find anyone who had some solid information about a good, safe, early ice spot. I've already mentioned that there are some ice shacks out at Third River on Lake Winnie, but the reports from up there are that the water is so murky that no one can see the fish moving toward the hole. It didn't sound like many fish have been coming in so far. 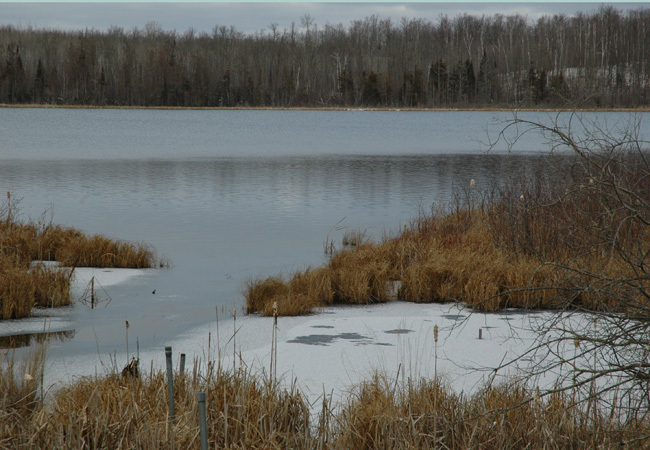 Some of the other shallow lakes in the area have ice cover, but not necessarily in good fishing locations and most are suffering now from slush problems that resulted from the recent snowfall(s). 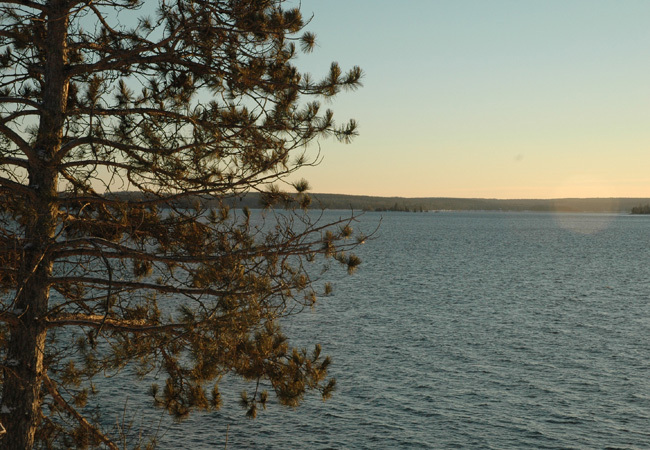 Many deeper lakes in the area such as Pokegama, Trout, Cass, Deer and others are still wide open! Just enough ice around the shoreline and back bays to let you know that winter is coming, but not enough to let you get out on the lake. The good news about these lakes is that when they freeze, they might have the trouble with slush that some of the others will. The news isn't all bad though, there's a good stretch of cold weather predicted for the weekend and I noticed yesterday that in some of the slushy areas, the water had wicked up toward the surface and the saturated snow in these areas are starting to freeze up again. Obviously, the shallower the snow cover, the faster some of these troubles will clear up, but this is good news for lots of lakes. According to Chad Benson, the slush problems on Upper Red Lake are starting to clear up too, but there are only 2-3 inches of "good ice" underneath. They were able to walk out a couple of days ago, but so far, no ATVs. Hey, hang in there! It was 5 degrees here at 4:30 this morning and I'll bet the ice conditions are improving by the hour now, I heard a radio report yesterday that we're looking forward to our first sub-zero temperatures of the season arriving this weekend, so I'm guessing I'll have a little more news to report during the up-coming week. Field Report December 1, 2010 Ice Report: More snow blew into the area on Tuesday, so this is another little delay in hitting the ice. But this time, the temperatures stayed below freezing and there was at least some new ice forming throughout the day. On days like this, it's hard to get a handle on developing conditions, because everyone is inside hiding from the weather instead of being out and about. Driving to some of the lakes didn't do me much good because with the new snow cover, all of the ice looks the same right now. The forecast looks good though, partly sunny with highs in the mid-teens, that should get the water started freezing quickly again. I've heard from several anglers that had hoped to come up this weekend, so I will plan another little tour around the area today and try to get a better update. I've been doing a little pouting about not getting enough time to duck hunt and I have another special offer for someone who would be interested in trading some duck hunting for a walleye, pike or musky fishing trip. You never know, Arkansas? Nebraska? Kansas? Maybe we can work together, let me hear your ideas. Field Report November 30, 2010 Ice Report: Well, It's kind of a slow news day for me, Monday didn't bring any big surprises and I'm afraid that we lost a little more ground when it comes to forming ice. As the daytime temperature reached back up into the high 20° to low 30° range again, more slush and heavy, wet snow cause the thin ice to sag. We have a very small pond behind the barn and even the ice on it has become full of slush now. If you've got some late fall chores to get done, do 'em now and that way you'll be ready to play when the ice finally gets good. 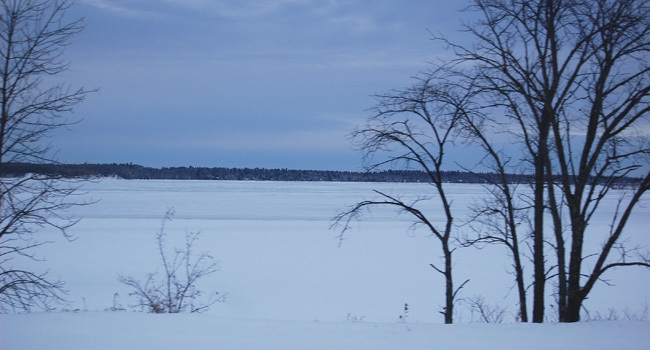 The folks up at Sportsman's Lodge on Lake of the Woods are reporting 1-2 inches of ice cover accross the main lake and are optimistic about the possibility of good ice as early as December 4th. Dixon Lake Resort on Lake Winnie reports 6 inches of ice in the Third River area, but lots of slush everywhere. They're offering rides out to the ice shacks, but traveling on your own will be difficult. There's a new weather system moving in right now and a lot will depend on the amount of snow we get with this system. If it's not much, then the cold front coming in behind the storm will get the ball rolling again. Hey, I'd really rather be outside, but I look at this as an opportunity to get caught up on my chores. Today I'll finish cutting up my Deer and then if the weather is okay, I'll take a little tour toward some of the lakes South of Deer River to see what they look like. Field Report November 29, 2010 Ice Report: Hey, it's amazing how warm 40 degrees really is. All you have to do is go hunting for a week in 0°f - 15°f and then as soon as the temperature hits 40°f again, you'll be sweating as soon as you walk 25 yards. As nice as it is to have a couple of great weather days, I'm afraid that now we're losing ground in terms of the arrival of the ice fishing season. During the afternoon on Sunday, Arne and I combined a little Deer hunting, scouting and lake checking session. Some of the smaller lakes that froze well ahead of the snow appear to be holding their own, at least for now. But on the larger lakes that have a lot of snow cover, you can see the gray areas where water is wicking up into the snow and in some spots there's even open water again. In the long run, this will be helpful because this will re-freeze some of the trouble spots and we should have better ice later this winter because of it. On some of the deeper lakes like Deer, Bluewater, Caribou and others, the ice that had formed around the edges is actually receding and it looks like some of them will be wide open again in a couple of days. It will freeze back up fast once we get another cold snap, but a lot depends on this weather system that's due to move in on Tuesday. If we don't get too much snow, the cold front that arrives later this week will get the ball rolling again. 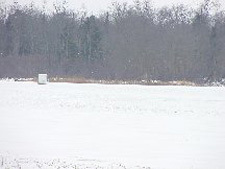 If the snow gets deeper, more problem spots will crop up. Arne and I have both used our Buck tags now, but we haven't got the Deer season out of our systems yet. We're not allowed to hunt antlerless Deer in our zone, so we decided to go looking for some territory where we can still hunt antlerless Deer. The Deer zones are kind of broken up this year, so we had to cover a lot of area searching for public places to hunt. It's really interesting how many Deer you see whenever you get close to houses and people. To me, it looks like the Deer would rather live in someones back yard, eating the grass off of the septic mound, as opposed to living out there in those cold woods. Anyway, it looks like we have some searching to do if we're going to get that one last Deer for the freezer. Even I have to stay home and get caught up on Deer processing, paperwork and phone calls occasionally, so I won't get out a lot today, but if there are any really hot developments, I'll let you know. Oh and one last thought, I guess Kev was worried about the Tenderloins from my Deer the other day. Have no fear pal, click here to see one of their most recent locations. Field Report November 28, 2010 Ice Report: There wasn't a lot of progrerss on the ice production around Deer River on Saturday. After a long spell of gloomy, grey weather, the sun finally made a cameo appearance and warmed the air up for a few hours. Now that most of the lakes have ice cover, it's hard to tell by looking how much new ice we get from one day to the next, but it's getting better. Up at Third River Flowage on the Northwest corner of Lake Winnie, the folks from Dixon Lake Resort do already have some dark house out. They reported slush problems near the shoreline, but that the ice further out was good and was about 5 inches thick as of Saturday. Northern Pike spearing is typically what draws the earliest attention and so far, Bill at Fred's Baits said that they're mainly selling larger Suckers to a handful of darkhouse anglers. But he said that there was already a second-hand report about someone bagging some Crappies too. I'll check into that today and get a little more information. I'll also be checking the ice thickness at a couple of lakes myself later today. By this time next week, I think the ice season will be getting into high gear. Hey, Good things come to those who wait. Some of my friends have wondered why I'm willing to put up with Deer Hunting when I only see one Deer for every 5 or 6 days of hunting. Well, looky here, this is only the 4th buck I've seen this entire season, but it was worth every minute of waiting! It also proves again, that I was born to hunt with a muzzleloader. Actually, I think it was just a good day to be out in the woods. The wind finally stopped blowing, the sun came out and made it really comfortable, except for a quick stop to let the dogs out, I never stepped foot inside for the whole day. My Deer Hunting GURU Arne Danielson, invited me to go along on a hunt that he'd organized with two of his nephews, both really great guys. I got the feeling that it would be a good day when Kevin Storlie bagged a nice doe at the first spot, on the first drive. 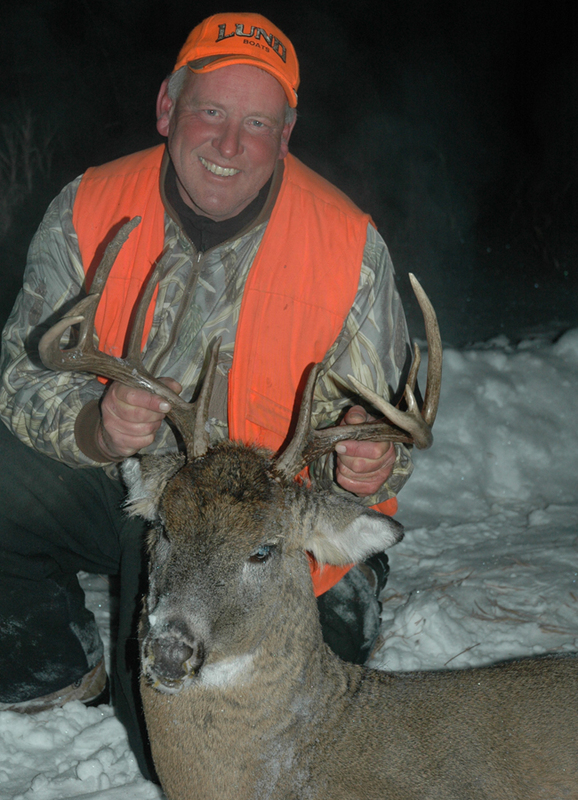 According to Arne, "Kev" is famous for bagging huge Deer on these family drives, so they didn't even bat an eyelash when he bagged this doe. Subsequent stops didn't yeild any more Deer for us, but at each location, the drivers were tracking Deer that had moved out ahead of them. I just had the feeling that sooner or later there would be another chance. Later, after I split the scene to head up to my own Deer stand, they saw and had chances to shoot at several more Deer, so I guess that feeling was right. Since I spent all of my time out in the snow, I didn't have the opportunity to use my phone to check with the bait shops. but today I'll make some calls and get some more reports about folks that are finding the early fishing spots. Field Report November 27, 2010 Ice Report: Okay ice watchers, things are starting to happen around the Deer River area now, some good and some not so good. On Friday I took my mom for a little ride and we checked out several of the larger lakes in the area. I guess I might as well get the crummy news out of the way first, then hit you with the highlights. Red Lake: According to my buddy Chad Benson, Red had already frozen over before we got the snow and that's bad. He said that there is now a thin 1 to 3 inch sheet of ice covered with nearly a foot of snow, so we should be expecting some serious slush problems. Chad said this is going to delay getting houses out on the lake for while and he's planning on waiting until next week before checking the progress again. Round Lake: We drove up to Round and checked the ice at the South landing on Friday. The situation there appears to be the same as it is on Red Lake, with thin ice formed before the snowfall. The lake is now completely covered with ice, but as I walked out on to the ice, my tracks filled with water almost instantly as I discovered that what looks like snow cover, is really 6 to 10 inches of wet, soupy slush. This will delay getting good ice up here for sure. Lake Winnie: I didn't get to walk out on any ice at Lake Winnie, but from the bridge at the dam, Tamarack Bay appears to be frozen over except for the river channel near the dam. There was a report from people who checked the Bowen's Flats area that the North shore has just frozen during the past 48 hours. Wherever the snow fell into open water, ice will be fine, but there will probably be some trouble near shore until the plows can get on to the lake. Sand Lake: The news got better as I moved East. When I got to the public landing at Sand lake, I expected to see some open water down in "the Boot", but it was frozen completely. This was the best ice that I found anywhere on Friday. 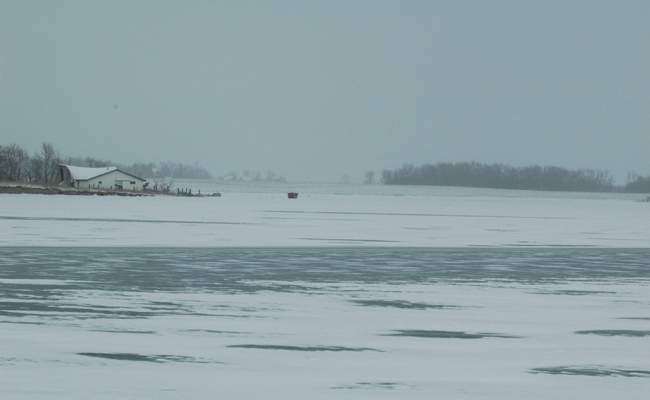 I was able to walk out about 50 yards from the landing before I heard the first crack in the ice and I think that if I was really in a hurry to be the first one out there, I could find a fishing spot sometime during the next few days. Bowstring Lake: When we arrived at Bowstring, the lake was completely ice covered, but the ice is really thin. I walked a few feet out from the North landing and the ice started cracking and groaning immediately. I think this is good news though because it means that most of the lake froze after the snowfall. It looks like a few more days of cold weather will really improve the conditions at 'the Bow". According to the folks at Fred's Bait, there were a handful of anglers fishing in the Deer River area on Friday. The ones who are out already, are fishing on small, shallow lakes that froze a week or so before we got the first snow. Things will move fast from here on out, so I'll try to have updates for a couple of lakes nearly every day. Hey, For me, I can't quite get into the ice fishing mode until I get serious about bagging a buck. The muzzleloader season starts today and now that I'm used to the chilly weather, I'm going to log some hours in the stand. Ahh..another chance to fight off winter. 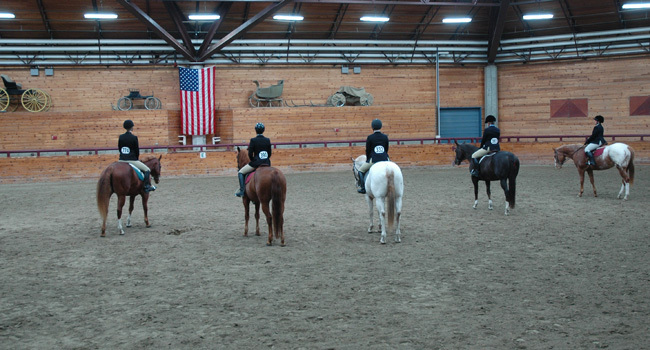 Field Report November 26, 2010 Ice Report: It's only 4:30 AM and I've already learned something new today! If it's too soon to ice fish because there's not enough ice, the muzzleloader deer season doesn't open until Saturday and there's a stack of paperwork to catch up on, then this must be why they call today BLACK FRIDAY! If you're like me and go into "wild animal mode" in the fall, then there's nothing worse than the prospect of getting stuck inside the house for a whole day. Don't worry though, you can sit around munching on yesterday's left-overs if you want to, I'll find something to do outside, even if I have to go and count the pine needles of the tree by my deer stand. All joking aside, I have a little route planned out for today and I'll be making a run around the area to see what the ice looks like on several of the popular, early spots. After the feast wound down yesterday, I ran out and plowed some snow, then I checked the nearest lake to the house which happens to be Chase Lake. I found that the shallow back bay was frozen, but the deeper, main lake section was still open. Similar reports are coming in from all around the area, the ice is forming quickly on smaller, shallow lakes and in the shallow back bays of larger lakes, but there's still a ton of open water out there. My guess is that there will be a few anglers who find isolated spots to fish this weekend, but I'd still plan on playing it safe and wait until next week. Hey, I'll bet your thanksgiving was fantastic and I hope you've got a good reason to get outside this weekend. For me, I'll be looking forward to getting serious about the muzzleloader deer season and I'll bet some ice fishing is in the really near future too. One final thought, even though it seems like winter is just beginning, we are now officially less than 4-1/2 months to the next open water fishing opportunity on the border waters and only 168 days away from the statewide 2011 Walleye Fishing Opener! Field Report November 25, 2010 Ice Report: I'm afraid that Wednesday's weather will be a setback for ice fishermen in the Deer River area. With so many lakes just barely frozen, all of this new snow is going to give us some slush problems. The good news is that there are still a lot of area lakes that weren't frozen over yet and on these lakes, the snow is probably helping to speed up the freezing process. For now, play it safe and assume that this weekend is going to be too early for your first trip out. Conditions are changing fast though and I'm including a few links to folks that can help with developing conditions. Fred's Bait in Deer River will be open daily beginning on Friday 11-26-2010, Dixon Lake Resort has an ice and snow conditions hotline and Frontier Sports in Marcell can help with ice reports in the edge of the wilderness area. Since my daughter Annalee and her boyfriend Austin showed up a day earlier than planned, we had a little extra time spend together on Wednesday. We decided to make a quick run over to Bader's Pheasant Run to try and gather some birds for a nice dinner. 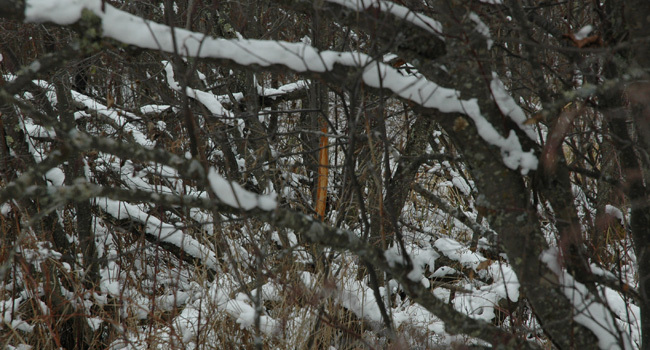 Luckily, we hit the timing just right and had about three hours to hunt before the weather turned back to snow. 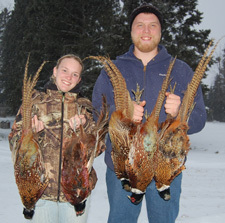 We made it home safe and sound, cleaned up a bunch of birds, then Annalee and I fixed the family a great Pheasant dinner. Today, we'll be fixing the Turkey early so that they can get on the road to Austin's family. By then, I should be ready for something to do again, so I'll try to get out and check on a few lakes again this afternoon. Hey, I'm hoping you have a great Thanksgiving. For me, there's a lot to be thankful for and I'll be counting my blessings all day long! Field Report November 24, 2010 Ice Report: Well a week ago we were looking out at open water and wondering if there would be ice before December 1st. Today, the lakes are freeezing faster than we can keep up! In fact we just cut our North Dakota hunting trip short because the lakes froze up so fast that we literally watched the ducks pack up and leave in a single day. When we arrived last Saturday, we could see that we'd be watching the freeze up and watch it we did. On day 1 there were lots of small ponds frozen already, but the larger lakes still had open water and there were lots of Ducks and Geese in the area. 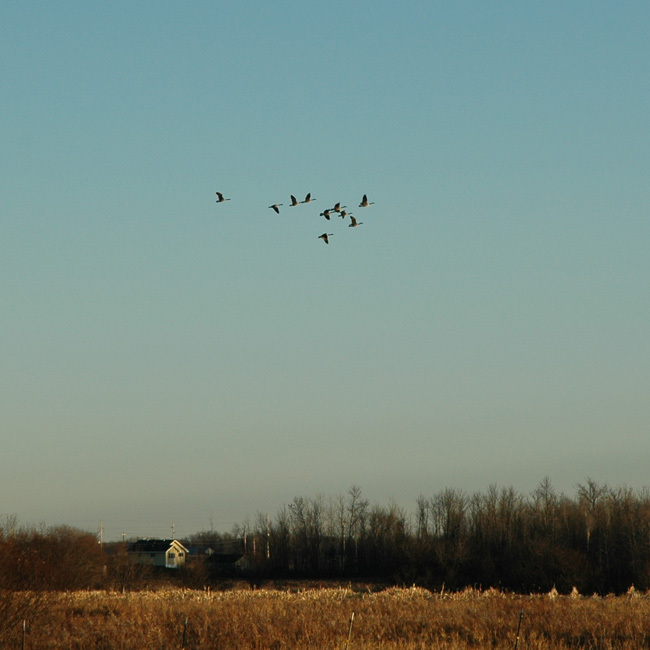 On Sunday morning we had a great hunt for Mallards and large flocks of birds continued to fly throughout the entire day. By Sunday evening, we could see flock after flock all heading South as the snow and cold Northwest winds blew into the area. 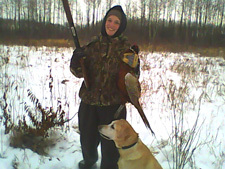 On Monday we started our day hunting for Pheasants and the game plan was to hunt ducks in the afternoon. By mid-day there wasn't a duck or goose to be found and it was getting really hard to find even a tiny hole of open water. On Tuesday morning we woke up to a temperature of ZERO degrees and calm breeze. 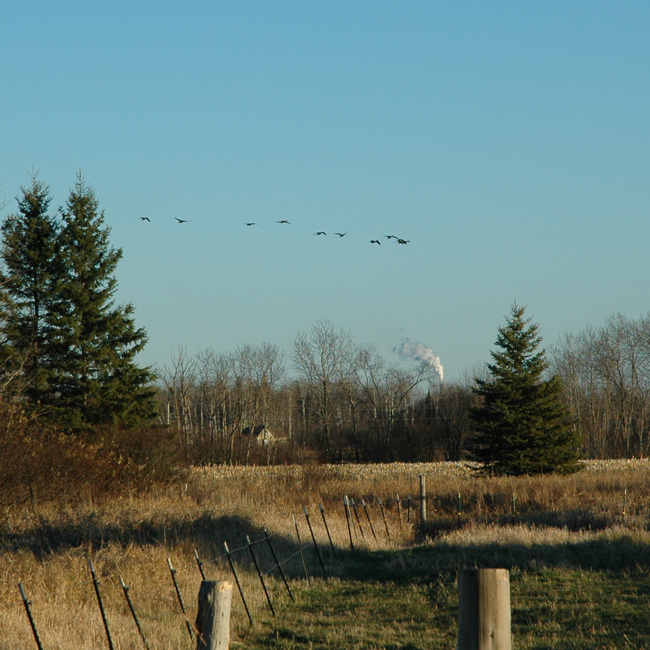 As we arrived at the field where we planned to hunt Pheasants, we looked accross the horizon at an empty sky. It was obvious that Duck hunting for 2010 was now behind us, so we headed into the Cattails one last time, bagged our Pheasants and packed up the truck to head home a day early. Now just because we had to head home early doesn't mean we didn't have a wonderful time, in fact we had one last great day in the duck blinds and a couple of really great Pheasant hunts too! I added some new pictures to the hunting slide show that you can check out if you want to. Our drive home was really interesting because all of the water that was open as we headed west on Saturday was now either frozen already or getting really close to freezing. As we headed through Detroit lakes, we watched a couple of ice fishermen sneaking accross the ice so that they to be the first ones out to "the secret spot". Hey, I'll be spending my morning cooking a big Turkey for everyone on Thursday, but I know that by Friday I'll be ready to get out of the house again. I have some catching up to do today, but I'll get a good report toghether for tomorrow morning because I have a hunch that there will already be a couple of spots that you could fish this weekend. 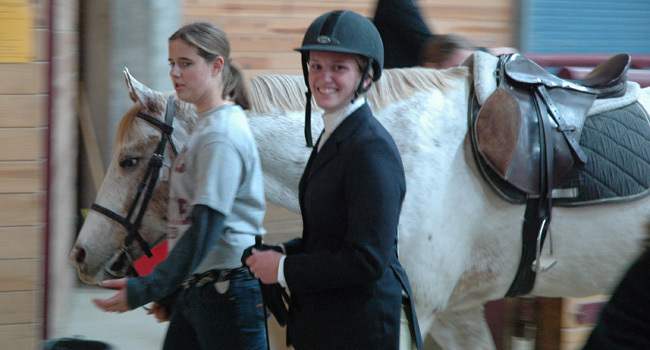 Field Report November 19, 2010 Ice Report: There's good news and there's bad news. First the bad news; I'm out of town for a few days trying to shoot a Pheasant or maybe even a duck, so there won't be any field reports until next Thursday. Now the good news; I'm out of town for a few days trying to shoot a Pheasant or maybe even a duck, so there won't be any field reports until next Thursday. Ha Ha...I hope you're having a great time and I promise to get a great ice report together as soon as I can next week. Hey, Even the Early Bird has to go play once in a while! See Ya! Field Report November 19, 2010 Ice Report: There wasn't a lot of new ice developed on Thursday, but the air temperatures did manage to stay below freezing in the Deer River area so at least we didn't lose any ground. I checked on a few of the deeper lakes close to home and there is still open water on all of them except for back bays and shallow feeder creeks. The weather right now (Friday 5:30 AM) is about as crummy as it can get, lots of wind and freezing rain. I just came in from the yard and there's already an 1/8th inch coating of ice on the windows, so we're making ice one way or another! We'll have to see how the rest of the day plays out around here, but it's looking like we might not be out and about too much. My last trip out to the Deer stand was un-eventful. At mid-day I was really optimistic, the sun had come out, it was calm and inviting. By the time I got to my stand, the wind had come up and it was gloomy and grey again and there was nothing moving until well past shooting time had ended. On my walk back to the truck, I did see one Doe, but that's it for me. Deer hunting is over for me now until the muzzle loader season opens, but Katie managed to sweet talk herself into an invitation to a Deer camp belonging to some friends of ours. Maybe she can use her good luck charm to help them bag a Deer for their freezer. 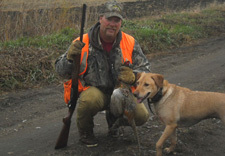 I'll be packing my bags today getting ready to head back to North Dakota for some Pheasant, Goose and Duck hunting. We'll have four more days to try and get that out of our systems and I'm really hoping that at least one flock of Mallards forgot to fly south and is still waiting over there for us. Pheasant hunting should still be okay too and that's probably going to take up the lion's share of our time anyway. Hey, You Deer hunters have a great weekend! I hope you bag a trophy this weekend and if you do, please don't rub it in too badly. Remember, I can still get even during the Muzzy season and I could get really serious if I need to. Final thought, if you want some really good advice, make sure you have sedatives on hand when you're watching the Vikings vs Green Bay game on Sunday. Field Report November 18, 2010 Ice Report: It won't be long now, Ice covers almost all of the smaller ponds around Deer River. I stopped in at the landing on White Oak Lake on Wednesday and there was ice from the shoreline out to the inside edges of the Wild Rice, then open water from the outside edges toward the center of the lake. With overnight lows in the low to mid teens, I'm sure that there's a lot of water freezing right now. 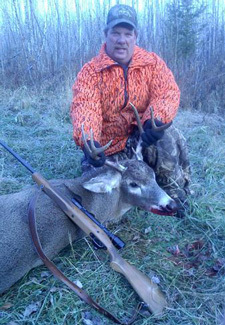 The firearms Deer Season took another step toward winding down for me on Wednesday afternoon when Jane filled out her "Antlerless Deer Tag" by taking what turned out to be a young buck. Since she got a Deer last year as well, this marks the second season of an official winning streak for her. With two tags filled already, we're getting close to having the freezer stocked for winter. So from here on out, I'm going to get more serious about finding a larger buck. Even though we're not seeing that much during the daylight, when I went scouting yesterday, I found lots of brand new sign in the heavy Alders and Willows. In fact, I think I might be finding more sign than I typically do, so I'm encouraged about the chances of finding a nice one. I'll probably have to continue the search into the Muzzle Loader Season to finally win the game though because my addiction to bird hunting is going to take me out of the game this weekend. 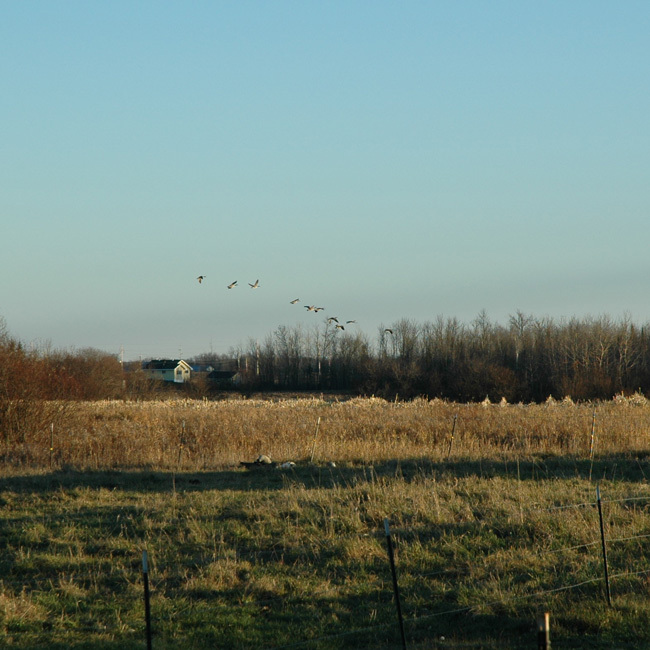 Hey, on Tuesday I mentioned seeing the Snow Geese land in the field near the house. Well they paid me a return visit on Wednesday and this time I was a little sneakier and managed to get a picture, albeit kind of a long range one. 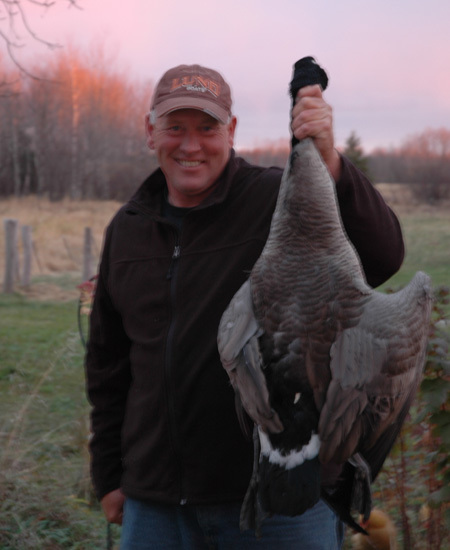 I am definitely turning into a softie because in years past, Snow Goose hunting has frustrated me so badly that I should have gone on a dead run into the house to get a shotgun instead of the camera. Not this time though, these two seem friendlier, more like pals, so I think I'll just be happy to watch for them each day until they get the idea to move south. Today I'll get Jane's Deer cut up before it freezes and then I'll take one more chance in my own stand this afternoon. After that, I'll have to live the rest of the Deer season vicariously through my friends who will be spending the weekend watching for trophies. 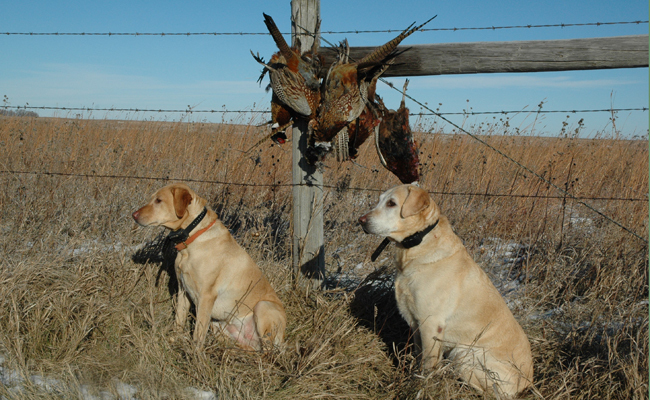 There's going to be a gap in the daily reports for a few days while Bill, Chester and I get some more bird hunting out of our systems in North Dakota. Next week, I'll be covering some more ground scouting and keeping tabs on the early ice. Field Report November 17, 2010 Ice Report: For me, today marked the beginning of the countdown to first ice in the Deer River area. It was the first day this season that I've seen ice on a dozen or so small ponds and it's also my first discovery of shoreline ice on a lake. 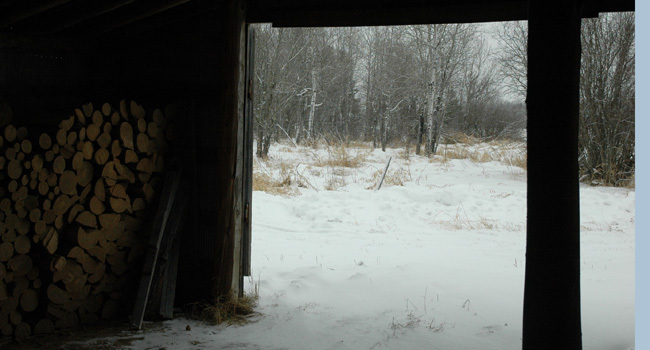 At about 10:00 PM last night, the air temperature just North of Deer River was 25 degrees and the wind was calm, so it looks like "Uncle Gurn" might get his wish of hitting a big Pike from inside his dark-house pretty soon. My friend, Jason Green is traveling through North Dakota on business right now and called in with a report to let me know that most of the small ponds in the upper (North) half of the state are frozen solid already. This might be good news for I, Bill and Chester as we head toward North Dakota this weekend. Our main mission will be Pheasant hunting, but sometimes if the small ponds freeze at the right time, the ducks bunch up on bigger lakes and we get a chance to try and stage one last rally for the season. I didn't spend any time in the Deer Stand on Tuesday because of other business that I needed to take care of, so I'll have renewed enthusiasm when I head back out today. Friends from around the area reported that movement was slow again on Tuesday. Even though there is new "buck sign" showing up, most of the movement continues to be during the night. With a little more serious cold snap heading our way, we just might see the movement pick up. Hey, you know how I love to see birds. 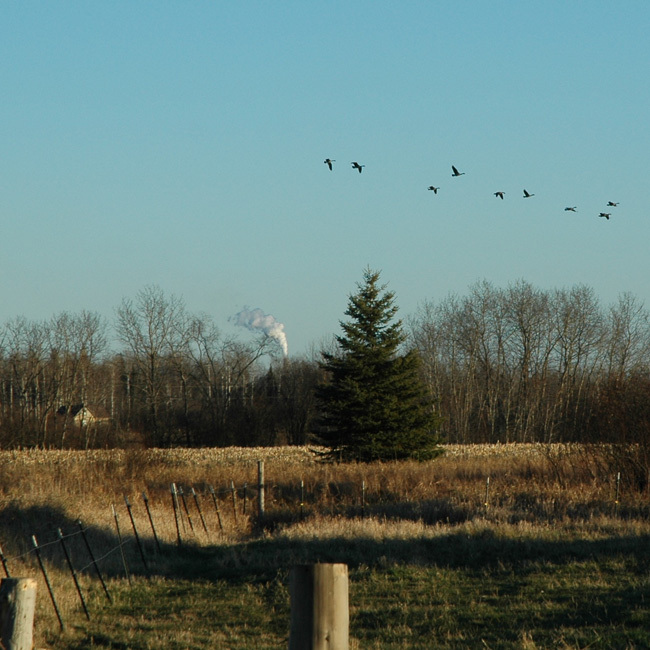 I don't think it's too unusual, but for me, yesterday was the first time I've seen Snow Geese in Deer River. Just as I was heading out to the truck to leave for Grand Rapids, I saw a pair of them land in the cultivated corn field next to our house. I really wanted to get a picture of them, but before I could get there, they took off. I'll be hoping that they pay another visit and next time I'll try to be sneakier. For those of you located in the area, The Itasca Gun Club Annual Meeting date was formalized at our meeting last night. January 14, 2011 at the Eagles Club in Grand Rapids, MN. I'll get an announcement on the Gun Club Website later today. Field Report November 16, 2010 Monday didn't work out as great as I had hoped. Aside from being a grey, dreary day, the Deer seemed to have gotten used to the new cover conditions and had gone back into their night feeding mode. Nothing much moving in the early morning, I sat on my stand until just after 9:00 AM without seeing a thing. 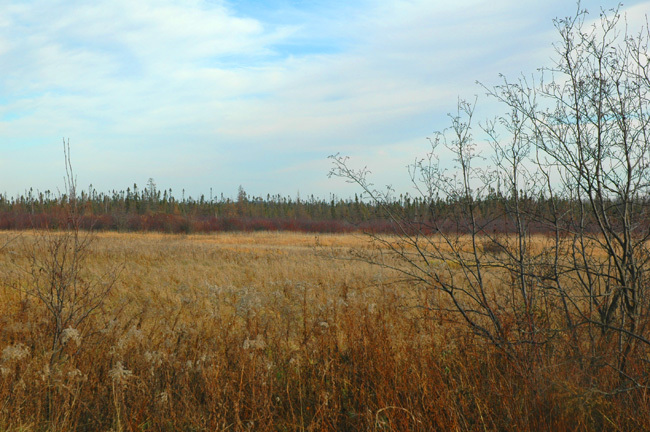 By now, I needed to get some fresh air, so I started walking into an area where I had planned to scout for a larger buck. The cover had grown in really thick since the last time I walked this trail and was on my knees a couple of times to get under the willows. I made it about a half mile before I found water coming over the tops of my boots. I knew from past experience that it would get worse as I moved further in, so hmm...I headed back out and took a breather as I studied that spot on the map from every possible angle. Hey, sometimes there are places that you just can't get to without chasing your trophy away before you get there. This is one of those protected spots, layers of under brush, deep water and noisy dead branches. If I want this particular Deer, it's going to have to come to me. 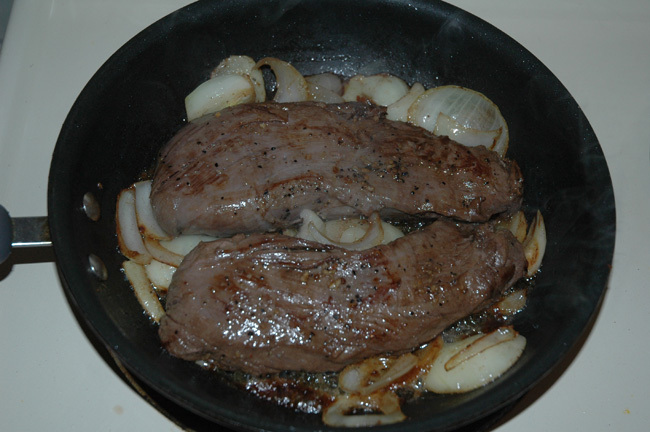 To kill time, I went home to process the Venison we already had hanging there and finished most of it before it was time to head back out into the stand. The afternoon didn't go much better though, another session of total peace and quiet, but no critters. Ice Report, during my travels to and from the stand, I did find a couple of small ponds that were covered with a thin layer of ice. The air temperatures are hovering just around 30 degrees, so there's going to be some ice forming, but it will be slow. December 1st? maybe. Today will be a forced day off from hunting for me. Meetings, paperwork and home schooling are all on my agenda. All in all, I'll spend more time behind the wheel of the truck than I will in any one spot, but this is the time of year when these things need to be tended to. One of the key agenda items at the Walleye Advisory meeting will be invasive species. I know, it's not much fun to talk about, but our lives are going to be changed forever by these and we need to stay on top of the topic. Notice, the reminder about the Anglers for Habitat Meeting below. Invasives will be a topic on their agenda too and if you're anywhere near St. Cloud, try to check this meeting out. Field Report November 15, 2010 Now that we have some snow cover and colder temperatures, the Deer are getting a little more restless. It was interesting to see how many new tracks there were in the snow between Saturday evening and first light on Sunday morning. We're always chatting about how the Deer go "nocturnal" once the rifle season opens, but the snow gives us a way of proving the theory. I'm still amazed at how much new sign shows up in just one night and I have to admit that it perks up my interest to see the fresh tracks. Sunday morning was the first chance this season that Jane has had to pull the trigger. A nice "fork-horn" buck walked out into the field in front of her, but something went wrong when she snapped off the safety and she was busted by the young buck. He ran up to the other end of the farm, stopped and stood looking back at our stand. I guess we'll have to hope he comes back again later. You could tell that the critters continued to move on Sunday evening because we could hear occassional rifle shots ringing from all around the area. We didn't get any more chances to bag a Deer, but I did leave a doe and her two fawns standing in the field in front of my stand at dark. 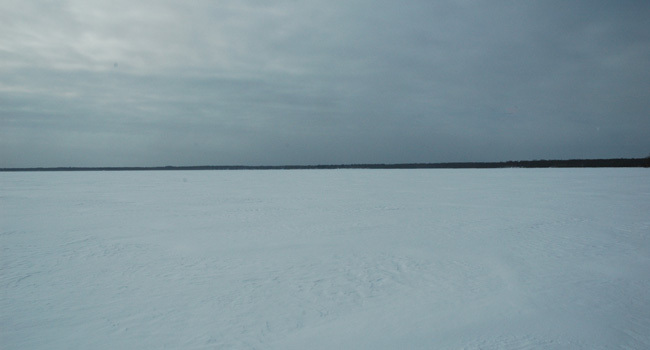 For the ice fishermen, it was a stroke of good luck that the snow fell into open water. I couldn't find any sign of ice on Sunday even in the shallowest ponds, so the snow should bring down water temperatures and help speed up the forming of new ice. We're headed in the right direction, but we're still going to need some colder daytime temperatures before it's going to freeze up. 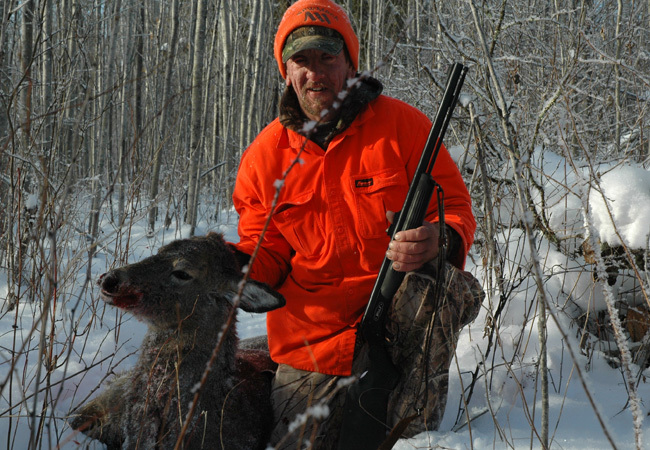 Field Report November 14, 2010 Northern Minnesota brings you "NEW AND IMPROVED Deer Hunting now with ADDED WHITENESS! It took a little while, but score one for the Deer hunters. 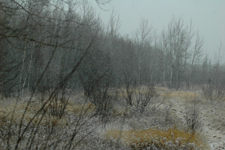 The predicted snowfall finally arrived in the Deer river area around 2:00 PM on Saturday afternoon. There's something about the snow coming down that usually triggers some movement and so with renewed enthusiasm, I packed up the family and got back out into our stands for the afternoon hunt. I really wanted katie to get a chance at a Deer, so I asked the girls to stay in their nice toasty warm stand where I'd seen the Doe on Friday hoping that she'd re-appear. 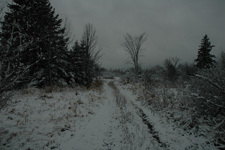 I dropped them off and then walked up the road to my old stand with high hopes that the snow would get them moving. Since we've had so few sightings and everyone had gotten hungry for venison, I had gotten permission from Katie to go ahead and fill her tag if I got the chance to bag an "eater". The afternoon went better for me than it did for the girls. 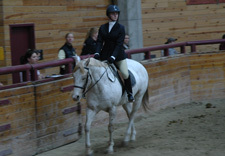 The pilot light on their heater blew out as soon as they got into the stand so they spent the afternoon without heat. 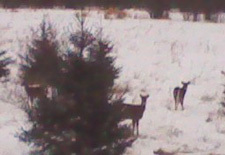 Then the Deer that I'd hoped they would spot, never appeared at their end of the farm. Up at my end, a modest buck with a really odd 5 point basket-rack made a mistake and walked out in front of me. Now I'm one bullet closer to needing some new ammo and we've got one in the freezer. Hey, I have to cut the report a little short today, because we're on our way back out. Maybe we're on a roll for a couple of days. Maybe I'll add some more later today if anything cool happens. Field Report November 13, 2010 The weather couldn't have been better for sitting in the Deer stand on Friday and apparently the Deer liked it too because I finally had my first couple of sightings for the season. In the morning, I had decided to cover some ground looking for a more productive place to hunt. Along the way, I spotted a nice Y-buck that had jumped across the road and stood looking at me from a cluster of Aspen trees. Nothing I could do about that one because he landed on posted property, but it was sure nice to see him. I spent some more time looking around, but never really found anything to get too excited about. In the afternoon/evening I was sitting in the stand counting the branches on a tree, when I finally noticed something moving about 500 yards from my stand. 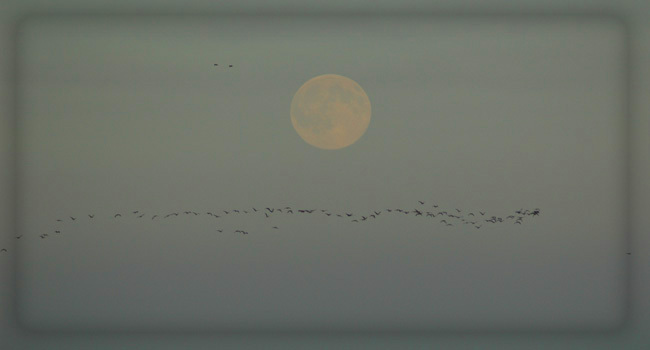 At that range, it took a few minutes of staring through the binoculars to be sure, but what do you know? There's actually a Deer out there, in fact I saw three of them, two does and a decent buck. The buck never got any closer than about 400 yards, so there was no opportunity for a shot, but at least now I have a project to work on. Sooner or later, I'll get another look at him. I read my own comment from yesterday about watching the grass turn brown and thought that I'd better expand on that thought and add something that sounds a little more positive. Hey, for me, whether or not I see a Deer is the least of my worries. I have all the patience in the world and I know that if I stick with it, I will eventually be rewarded. I decided to show a few pictures of what I get to look at while I'm waiting and it's not bad scenery at all. It amazes me how every day I have a new discovery, even though I've looked at every foot of this space over and over again, nature just has a way of tossing in a new detail every few minutes. In other words, just because there isn't always a Deer, doesn't make the wait any less wonderful! It sounds like we could be in for a major weather change this weekend and if we get the amount of snow that they're mentioning, we'll be really happy that we haven't had any lakes freeze up yet. It would be great to have the first major snow fall into open water so that we don't have to deal with all of the slush that occurs when the snow lands on thin, soft ice. In fact I hope it does snow so we can get a look at which Deer sign is new and which isn't. That would make the search a little easier. Field Report November 12, 2010 The vibe was good, the weather had changed and the blustery West wind blew in cold temperatures and dark grey skies. That along with my past history of usually having "good luck" on the first Thursday of the rifle season, I was a little surprised that I didn't finally see my first Buck of the season. Well, I guess I'll just have to keep at it until I finally win. Things are starting to quiet down in the woods, lots of people are finished for the season and traffic is much lighter. Soon the Deer will be getting into a more "normal routine" again and they'll be easier to spot. This weekend, most of the family will be back out in their stands, so maybe the Deer will start to move around in time for one of us to get a shot. With the heavy wind and colder temperatures, I think we finally got to the point where almost everyone has given up on fishing for a few weeks. I'm still skeptical about how fast we're going to get some ice to work with, but the temps are dropping and today is predicted to be a light wind. It wouldn't take long to form ice, temps in the 20's and a few nights of calm seas would get it started really fast. 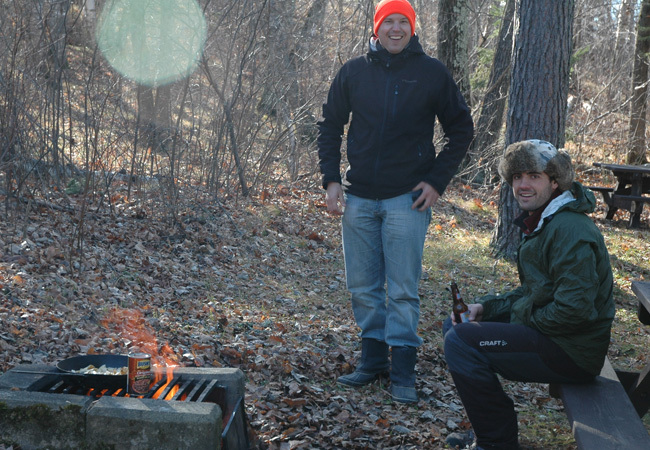 Last night my buddy Bill popped in here to grind his venison burger and after we finished, we sat by the fire listening to a steady flow of Tundra Swans migrating South. I mentioned a while back that the Swans seem to be just about the last birds to move out, so we were both thinking that this is a signal that there's a bigger change heading our way. Hey, I hope everyone heading out into the field this weekend gets a chance to test their shooting skills. Have a wonderful weekend and remember to keep me posted if you have a good story to share! Sorry for the short report, but I can't get nuthin' sitting in here. Field Report November 11, 2010 It's incredible to wake up in mid November at 4:00 AM and find the outside temperature at over 50 degrees like it was on Tuesday and Wednesday. I really can't remember ever being able to hunt in just jeans and a sweatshirt, but that's what I've been doing. Maybe that's a contributing factor in my slow start to the Deer season, or maybe just coincidence, but for now the Deer are temporarily winning. According to last year's average though, I still have two days to go before I'm scheduled to see my first one. That's right, last year I hunted 29 out of 32 possible days during the rifle and muzzleloader seasons combined. 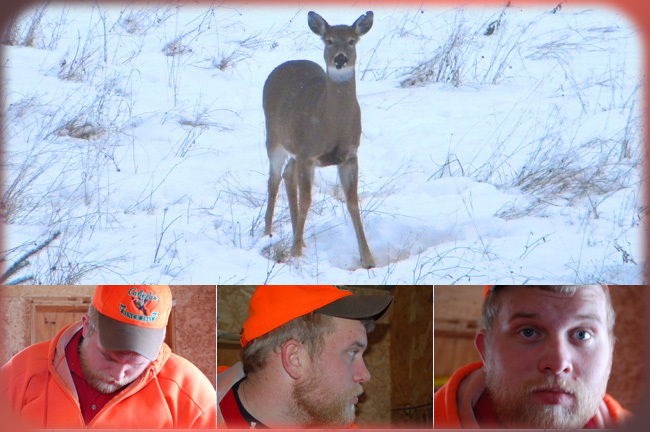 I averaged seeing one Deer every 6 days and never bagged my buck until the last weekend of the muzzleloader season. So in other words, I'm right on track for another victory! For those of you who have been sharpening your Pike spears and watching for ice, I'm afraid that we're actually losing ground. Last week, the small pond behind my barn was frozen for several days. But now, it's wide open again and so is every lake in the area. I went back through my old pictures looking for a fair comparison and found a couple from a few years ago that were taken on November 27th, 2003. 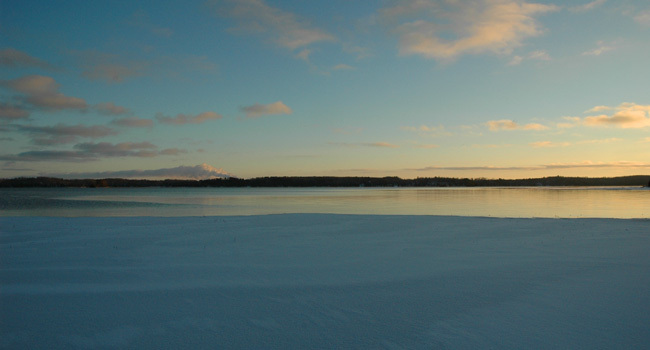 That year there was skim ice all around the shoreline of Deer Lake and Moose Lake was completely frozen already. I'm going to step out on a limb and say that I don't think we're going to get the same result this season. On the other hand, there's always been something magic about December 1st and it won't surpise me, if by then, "Uncle Gern" is already sitting somerwhere peering down through the ice at a weedbed waiting for a Pike. Field Report November 10, 2010 Tuesday's search for a better Deer hunting area didn't really give me much to go on for this morning, so I'm going to give it another try really early this morning on my own stand and then later on during the mid-day, I've enlisted the help of my good friend and "master scouter" Arne Danielson. Arne is going to help me discover the ultimate Deer hunting location and then I'm going to slip up into a tree stand and get that really big, dream buck. I got another text from my buddy Tim yesterday afternoon, he sent me a picture of his dad's (Don) nine point buck taken on Tuesday morning. They've been seeing a lot of Deer this season, so I know that they're out there, I just have to get away from the traffic and Timberwolves for a while until I discover an un-tapped area. We should be counting down the days to ice up right now, but looking at the lakes makes me wonder if we'll have ice by December 1st or not. This has happened before and in the past we've always had an ice fishing report by that date, but hmm... it's going to take a really cold snap, really soon if we're going to see ice in the next few weeks. Meanwhile, there are still boats on area lakes. Bill Powell fished on Cutfoot Sioux yesterday and reported slow fishing, but still good enough to gather enough for a fish fry. As I passed by the public landing on Deer Lake, there were 5 rigs parked in the lot and I assume that they were Musky fishing, probably taking advantage of the late fall Whitefish spawning pattern that draws Muskies into the shallows to feed. After hunitng this evening, I'll make a few calls to see if there are any reports about how they're doing. Hey, it's interesting how every situation presents an opportunity to learn. I got a message from one of my good friends and fishing customer David Chrz who said that the Geese were already arriving down in Abiline Texas. 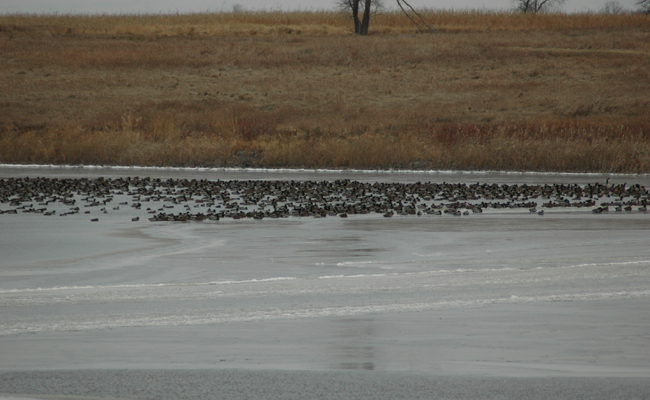 According to the weather and the food supply, the waterfowl should have no reason to move South, but still they are. Most of the Ducks and Geese are gone from our area now and some of the late season Ducks like Golden Eyes or Buffle Heads seem not to have shown up at all. I had been hoping that there would still be some waterfowl hanging around for our next trip to North Dakota. We're used to fighting the freeze up by now and conventional wisdom has usually been this is what causes them to move out. Apparently other influences are more powerful than the weather and food supply, so this will be an interesting scenario to watch over the next few weeks. Field Report November 9, 2010 Well, it looks like our time has come for another tough Deer hunting season at our family property. So far, our official sightings are at zero, but I know that there's at least one in the area because I almost snuck up on it yesterday, but got busted shortly before I could get a good look at it. We're used to slower hunting at our location, but this year seems tougher because I keep getting text messages from all of my friends telling me how great they're doing. It's even worse than Pheasant hunting with Bill Powell! One of the guides in our NMLOG group saw ten last evening, his daughter saw seventeen on Saturday morning and he told me that friends of his are seeing tons of Deer this season. Hmmm...well I guess it's time for me to dig in my heels and work a little harder. As much as I like having everyone tucked away in their nice tidy stands, it looks like we'll have to discover some new territory this year. I'll be hunting solo today so I guess I'm going to go and do some serious scouting and hopefully locate a spot to throw up a stand for tomorrow. Of course, anyone who has a serious over-population problem with Deer near their home, please feel free to let me know and I'll come on over to help out. My buddy Vern Valliant was up fishing on the Rainy River this weekend and fished the river from Birchdale up to Pinewood on Saturday morning and caught very few walleyes, most were very small. Water temperature was 40 degrees in the morning and he said that they saw very little bait in this area. They made a run East to fish smallies in the afternoon and he said that the action was a lot better fishing for the Bass. On Sunday, they skipped the river and headed out on to the lake instead, they fished areas in Sand Bay up to American Narrows, managed to catch a dozen or so walleyes with half in the protected slot and the biggest at 26". Vern said the best spot was right in the American Narrows in 26' to 30' of water. They had to leave at 3:00 pm and it seemed like the fish were just starting to really move up onto the point, so they'll have to get the rest of them next time. Vern is a good pal and he knows that I'm a sucker for sunrise/sunset pictures so he sent me a couple from the sunrise on their way out to the lake. Thanks Vern! Field Report November 8, 2010 On Sunday, I and Jane made it out into our deer stands by around 2:00 PM. Not too much action in our neck of the woods so far, neither of us spotted anything. 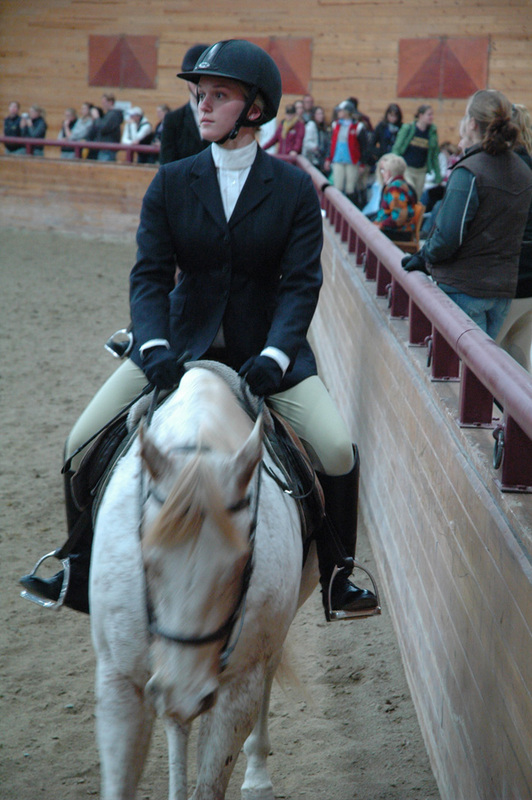 Today is a school holiday at Deer River, so this time, the magic of good luck will be with us as the whole family heads out to the farm together and Katie makes her way up into the stand. I had just a little time to talk with friends yesterday, it sounds like the opener was a good one for most everyone I hunt with. My Buddy Arne Danielson texted me by 8:00 AM on Saturday that he's already bagged a buck. On Sunday morning, Bill Powell shot me a text with the same message and later that afternoon Chester Powell did the same thing. Hmm....it looks like we'll be playing catch up this season, but sooner or later, we'll get in the game. On the fishing scene, it's time to start looking forward to the early ice and Northern Pike spearing opener. This isn't the first time that the weather looked like it would force folks to wait, but in past years, it always seems to catch up by December 1st. Yesterday morning our small pond was frozen for a few hours before the sun got warm. Surface temperatures on the lakes are down into the low 40 degree range, so it won't take much to skim over once we get more traditional overnight low temperatures. 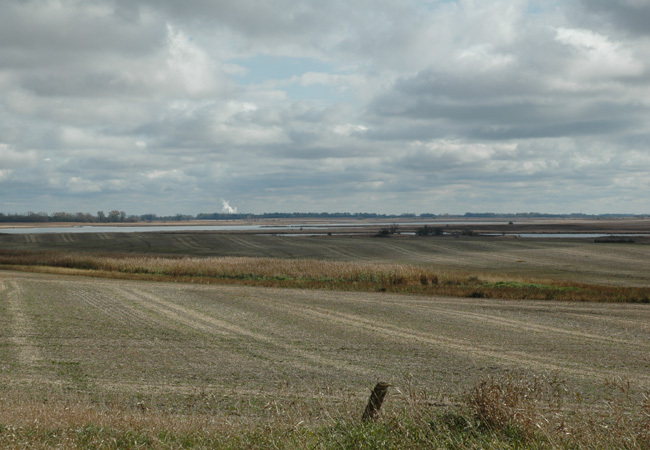 A little snippet of Walleye news, the public comment period for the Lake Winnie "protected slot limit" has passed and the comments have been tabulated. According to DNR Regional Fisheries in Grand Rapids, public opinion was generally favorable to both the 18"-26" and the 17"-26" protected slot with a bag limit of six fish. The official recommendation they passed on to officials at the main office in St. Paul is to stick with the current regulation of 17"-26" protected slot with a bag limit of six fish. This doesn't make it official, but since the regulation is already eleven years old, it sounds like it will probably be accepted. We have a Walleye Advisory Meeting on November 16th and I expect that we'll get an update at that meeting. Hey, not the most in-depth reporting going on up here right now, but I'll try to keep tabs on the freeze up in between sessions in the deer stand. 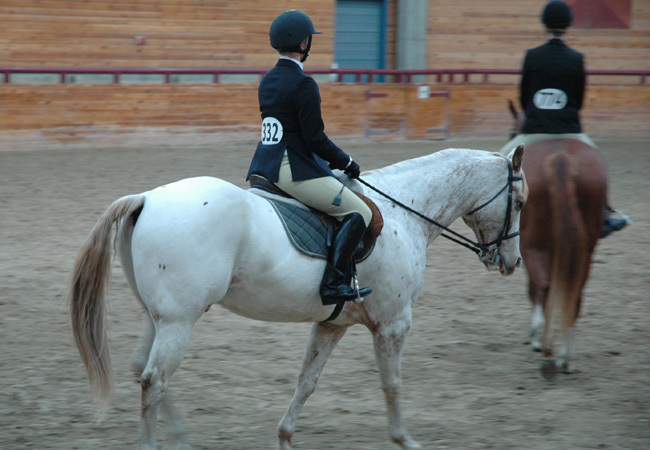 Field Report November 7, 2010 Well you know, I've spent quite a few Deer openers with Annalee, but never watching a horse show. It was worth it though. 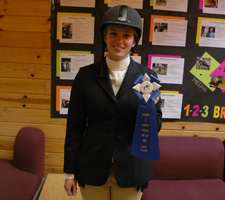 The show was great, the staff and team members were warm and welcoming in every possible way and as a bonus, I even got to see my daughter pick up a blue ribbon. Hey, that's it for today, I'll be back home and in the Deer stand today and maybe I'll pick up a fishing tip or two for tomorrow. I hope you're have a fantastic weekend! Field Report November 6, 2010 Well it's been a long time since I missed the Deer hunting opener, but on this particular occasion, we've got something a little more important to do. 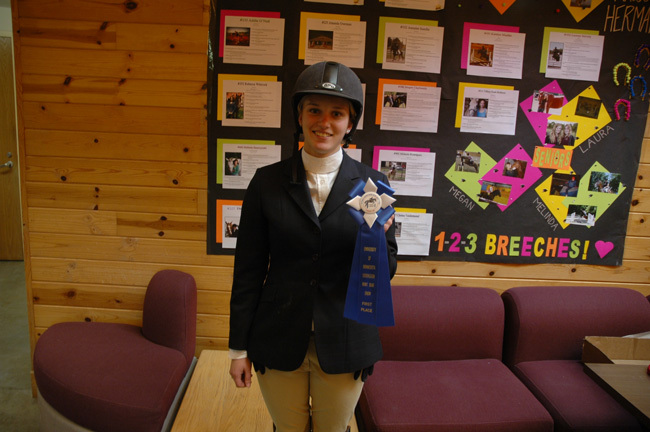 Since Annalee rode off to college and earned a spot on the Equestrian Team, she's collected ribbons at every event so far this season. Today is the first time that one of the shows is near by and falls on a day I can get free, so here we go to see my little girl ride. For those of you that know her, you'll remember her talking about doing this since she was about six years old and I can tell you that her passion hasn't let up a single bit! Just one quick note for all of the folks who helped out the Itasca Gun Club yesterday. As usual, it was a really busy day and we sighted in well over 200 guns. You are all so helpful and knowledgeable that it went off without a hitch. I really hope you all have a great hunt this weekend. I have a little slide show put up on the Itasca Gun Club website, take a look when you back inside. If you get a nice Deer this weekend, be sure to let us have a snapshot! Hey, that's it for today. No pontificating from the Early Bird. I hope you have a fantastic weekend! 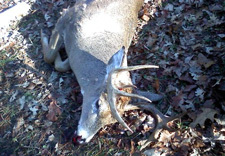 Field Report November 5, 2010 Well if this is a typical Deer Season Opener, I'll guess that most everyone has forgotten about fishing, at least for this weekend. I was at Ray's Sport & Marine yesterday getting an engine statistic scan and ran into a few of the area's last "die hard" anglers that all said they were finally putting their boats away for the winter. I almost did that myself yesterday until my buddy Arne Danielson talked me into holding off for another week or so just in case we get one more of those "I just gotta go" days mid-way through the Deer season. If you are going to fish this weekend, everyone I've talked to that fished on Cutfoot Sioux last week has reported catching enough fish to keep them happy. Also, if you get a day without too much wind, there are some decent reports still coming in from Leech Lake. Probably because of high, murky water, the Rainy River is really slow to turn on this fall, but if we go a few more days without any major rainfall and the water clears up, this can still be a great option. In the past, some of the better fishing has been as late as Thanksgiving weekend up there. For me, Deer hunting is going to take over for a while. Once I get into my Deer stand, the urge to fish just sort of goes away for a while. During the season, I'll keep posting some notes, but be sure to keep track of the Deer harvest by following the Deer Hunting Reports from Frontier Sports in Marcell. They usually have a great handle on what's going on and post a lot of Deer pictures. If you're on your way up today and haven't sighted in your Deer rifle, you can stop by the Itasca Gun Club. I'll be working out there all day along with seven other volunteers to help keep the lines moving. The range is open to the public from 9:00 AM until 5:00 PM, just click here and follow the link to sight in days for more details. Hey, I know that this is going to busy a busy weekend and it will be for me too. The time I usually use to get this report put together will be spent getting to the Deer stand in the morning, so chances are that I won't get much of a report back up again until Monday. Good luck this weekend and if you get the big one, be sure to let me know. 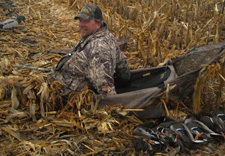 Field Report November 4, 2010 Last week I said that I wasn't ready for the end of the season and just my luck, the phone was ringing one last time with a special request from a man I'd fished with before, but hadn't heard from in several years. He wanted me to fish with Martin Wiesner, an engineer from Germany. Martin is an employee of Daimler and temporarily here on special training. He had never been on a fishing trip, never caught a Walleye and never had a shore lunch. So the request was simple, accomplish those three things in that order. I met both Martin and Nate Metelak (Hibbing, MN) for the first time on Wednesday and we headed toward the lake. It turns out that I really drew a lucky card. Not because we had great fishing, in fact it was kind of a tough bite for trying to teach someone how to catch 'em from scratch. No, it was just an all around great day in every sense of the word. Great weather, great conversation, lots of laughs, a respectable showing and a great way for me to wrap up the season. We spent our day fishing on Cutfoot Sioux where the fishing reports had been fairly good throughout the week. The high, blue skies and 45 degree water temperatures weren't the best conditions, but there was enough action to keep us interested. The main trouble for me was that the fish were scattered all over the lake. We found several areas where we could get them to bite, but the typical outcome would be to miss three or four hits, then catch one or two fish and then have to move to another spot. Ocassionally, I'd mark better schools of fish in deeper water, (16 to 20 feet) but these fish frustrated me by never biting. The fish that actually did bite were located in 9 to 12 feet of water and seemed to favor inside corners and areas that still had some weed growth. We were able to fish slowly enough that the 1/8 ounce Bug Eyes were plenty heavy to reach the bottom and while I don't usually get too hung up on colors, this time they really seemed to prefer the Glow and Pink combination. I was stubborn and tried some other colors, but eventually all three of us were using the glow/pink. We had both Rainbow Chubs and Fatheads and I couldn't tell much difference, except that the larger minnows were better than smaller ones. The bites were usually really light and any fish we missed were due to us trying to set the hook too quickly. If I was starting the day over, I'd have brought the largest Rainbows or small to medium Redtails, lip hooked them on 1/16 ounce jigs and fished as if we were using live bait rigs. Open the bail, feed 'em line etc...I think this might have put a few extra fish in the boat. All in all, it worked out okay. We released a few slot fish, had a great shore lunch and I was still able to send them home with seven keepr Walleyes. Best of all, Martin had the lion's share of the action, so score this as a victory for Germany, one new Walleye angler on his way home soon. Hey, one last thought from the lake. A short time after we cooked lunch on Wednesday and headed back out on to the water, I realized that I'd forgotten my camera in the truck. 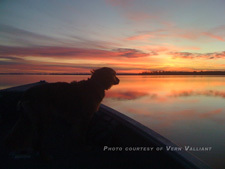 Since it was my last day of fishing open water, I really wanted to get that one final, great sunset picture for 2010. Later, I made a special trip back to get the camera. As soon as we got back out, I started counting the minutes until I could get my last, great shot. The sunset came, but there was no spectacular shot, the problem was that there wasn't a cloud in the sky. The sunset was still nice, but not firey or crimson, it just sort of faded from blue to gold and then to darkness. Without clouds and turbulence, there wasn't anything for the sun to reflect off of. It made me realize that if we're not willing to put up with clouds and rainy weather, we never get to see the great sunsets and rainbows. Hmmm... just a thought. Field Report November 3, 2010 Tuesday was a great day for checking out the Deer stands to be sure that everything was ready for the upcoming Deer opener. So after a quick trip to Chiropractor who fixed up the after-affects of one my heroic duck shots last week, I packed up the dogs and we went for a little stroll. You're going to be really surprised at how wet everything is in the woods this season. Out at our hunting land North of Deer River, there is standing water in the fields and every trail I checked was really wet. In some places, we have knee high water, so it's going to be really interesting moving around this year. As expected, buck sign in our area doesn't amount to much this year, but after hunting 29 days last year and only seeing a half dozen Deer, my hopes aren't that high anyway. Another thing to think about might be to remember your saws. We had a lot of wind this summer and fall so there are trees laying every which way out there right now. If you're in the area and haven't sighted in your rifle yet, it sounds like today would be a great time to get that taken care of. I stopped out at the range yesterday afternoon to check in and they had sighted in 126 guns so far. I always work the range on the Friday before opener and if you wait until then, you can count on standing in line! We get a ton of folks stopping in on their way up from the cities or elsewhere and we almost never have a slow moment. I was preparing for my fishing trip today (Wednesday) so I made some phone calls to friends and I got some decent reports about Walleye fishing in the area. According to Bill Powell at Fred's Bait, some of his customers have been doing well on Cutfoot Sioux during the daytime. I also talked to another guide buddy who repeated that report and said that the daytime action on Leech Lake has been holding up as well. Walleye action on the Rainy River continues to be slow, but the Smallmouth fishing has been okay. The Mississippi River is an option too and what the river lacks in action, it's making up for in size of the fish. Wind is going to be a problem today, so I have the river in mind as my back up plan in case Cutfoot fails me for some reason. Another friend has been doing well on panfish this week and so that's another option. Hey, after a day of being a good boy and doing my chores, I was rewarded with another spectacular light show. 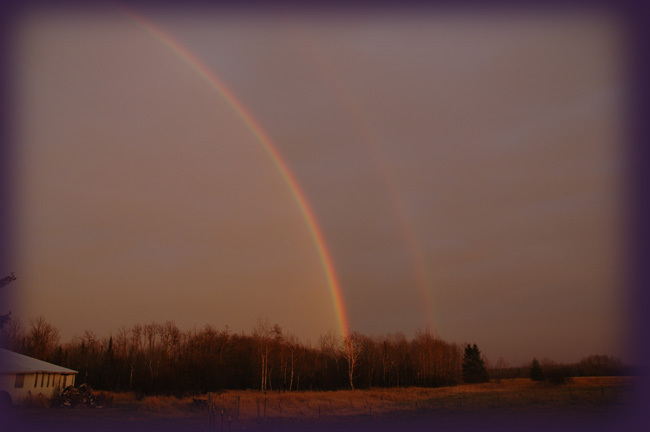 I only wish that I could take photos that do justice to the real thing, but here are some snaps of a great sunset and a double rainbow 1 - rainbow 2 that moved through my back yard in the evening. Field Report November 2, 2010 Why don't I let you in on a little secret? I think this might be another corollary to Murphy's Law, spend the day cleaning up the rig to put away for winter and you will get a phone call for a fishing trip. Just like washing your car before it rains, it never fails. It was a really nice afternoon and I saw a chance to get ahead on some chores, so that's what I did and now I'm working again on Wednesday. It's been a couple of weeks since I've been out, so I'm a little hesitant, but I think I ought to be able to drum up a little action if I work at it. I wouldn't mind a heads up though, so if you were out on the water during the past few days and want to steer me toward a great idea, I'd really appreciate it. As in the past, I want to throw an offer out there for you aspiring boat sales people. Help Jeff Sell The Boat and receive a free guided fishing trip! That's right, refer a buyer for this years rig, 2010 Lund 2000 Alaskan and I'll send you a gift certificate for a free Full Day Trip for 2 people and even throw in a shore lunch. See details Lund Alaskan For Sale. I won't be doing much in the field today except paying my deer stand a visit to check for repair work I need to do and dropping by the rifle range with Katie to tune up her Deer rifle. I know someone is always trying to get you to do something, but the elections today are really important to all of us "Dinosaurs" who still want to hunt, fish and pass the traditions down to our kids. Please do me a favor and go vote today for anyone who supports us in this effort. I know, they probably won't keep their promises anyway, but we have to try, right? Hey, if we do the right things now, we will have tons of chances to share experiences in the future! 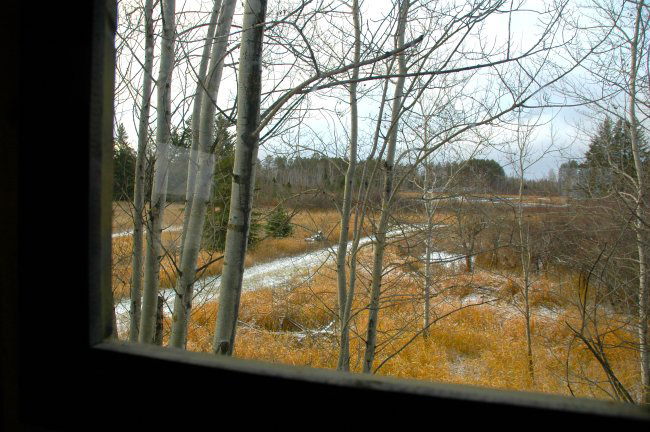 Field Report November 1, 2010 Well here we are already, November has arrived and there's only 5 days left before the firearms Deer season. Everyone at the (Itasca Gun Club) will be hustling this week as we try to help folks get all of their rifles sighted in before the end of our sight in days event on Friday. It will be a busy week around here too as I figure out how to squeeze in everything in before the snow flies. 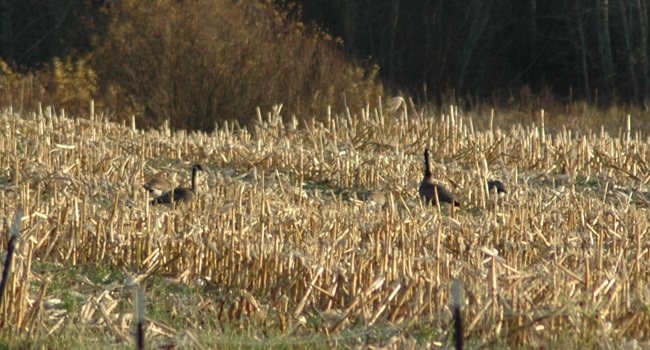 After I and Austin hunted the corn field a couple of evenings ago, I thought that we might have forced the honkers to jump over to someone else's field, but I guess that either I'm lucky or they're dumb. Those Geese just keep coming back to torment me and so by the time you read this, I and my hunting buddy Bill Powell should already be laying on our backs hoping that they (the Geese) drop in again this morning. Now how long could you stand watching this out of your own yard before you'd have to get the decoys and grab the shotgun? I've learned that I can last about 48 hours. After that I'll be getting the boat ready for what will probably be one last trip to the river before I grab my Deer rifle and disappear into the woods for a while. I talked to my friend Vern Valliant via a text yesterday and they were fishing for Smallmouth Bass on the Rainy River and doing well. The Walleye reports from up there are still on the slow side, but it sounds like you can catch some fish if you work at it. Vern's suggestion was to fish upstream from the Littlefork River because the water is somewhat clearer up there than it is downstream. That sounds right to me because our past experiences have always been best when current flow is moderate and water clarity is good. Closer to home, I heard an interesting report yesterday about the Mississippi River too. Walleye action in the Grand Rapids area has been slow, but steady and most of the fish are hefty 18 to 22 inchers. If you're near a decent stretch of river anywhere from Bemidji on down to the St. Cloud area, this might be a good time to float your favorite stretch of river. Hey, There's something really interesting about the passage of time. Do you realize that we're already only 5 months or so away from opportunities to fish the 2011 open water season? In the mean time, we still have to squeeze in a bunch more hunting, the ice fishing season and the boat show season. Winter is going to fly by fast! Be sure to listen or go to KAXE 91.7 FM Grand Rapids Radio on Thursdays at 6:20 AM. We usually try to expand on this report. If you miss the show, you can pick it up on the KAXE website. Ask fishing questions if you need to and I'll try to get back to you ASAP. Use these links to read Minnesota Fishing Artcicles and get information about my favorite MN Fishing Lakes. There aren't any houses on the main body of Lake Winnie so far. This will change soon. Just getting set up for the first time this season, Bill Powell gathers snow to bank up the base of their protable ice shack. This ice looks really good. It's about six inches thick, clear and solid. By this afternoon it will be even better. Ice at White Oak Lake in Deer River now supports dark houses, ATV's and there was even a car parked (close to shore) over shallow water on Saturday. A text from a family member came in to Austin Jones. While we were Deer Hunting, they were in their darkhouse and reported ten inches of ice. Hmmm...now that's a hard choice, waiting for a Deer (below) or waiting for a big Pike. There must be a way to do both at the same time? The view of Cass Lake from the landing at US Hwy 2. Looks frozen from here. Many of the area lakes will have curious anglers hoofing their way out this weekend. Ya! that's ice shacks alright. They walked these two portables out onto the lake, but if the cold weather holds for a few days, ATV's will be okay by early next week. On this deep lake, I was easily able to walk out toward the drop-off on very good ice. Out deeper, look at the contrast between rippling water and the smooth skim of new ice you can see forming. Yes, It's December and some of the lakes are still wide open. Here's the view from the Pokegama Golf Course in Grand Rapids. Above: An ice shelter ready to go. Below: Slush problems are starting to clear up as the water wicks toward the surface and re-freezes. 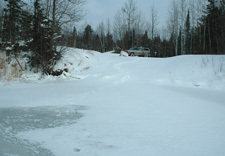 Snow makes the thin ice sag and forces water to wick up, causing slush. Some areas on deeper lakes are even opening back up. Warm weather will delay the ice season for a little while longer. Get the plow ready, looks like we're off to the start of a snowy winter. I love snow! Here's why I'm willing to wait for days at a time without seeing a deer, when I finally do, it's usually a nice one. Kevin Storlie started our day out right when he bagged this nice doe on the first drive of the morning. From the dam at the Southeast corner of Lake Winnie, most of the lake appears to be ice covered. 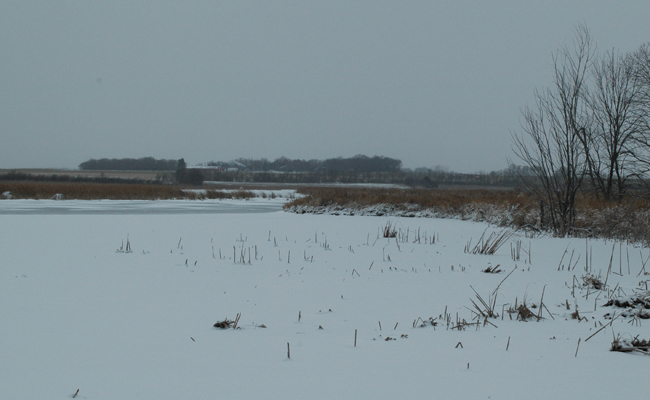 At the Sand Lake access, I was able to walk out 50 yards or so before hearing the first groan from thin ice. Conditions should improve quickly here. Bowstring Lake is completely ice covered now, but the ice was extremely thin on Friday. With a little extra time to kill on Wednesday, Annalee, Austin and I decided to make a quick run over to Bader's Pheasant Run to gather dinner. Here's the view from the Whippholt Landing on the South end of Leech Lake on Tuesday 11-23-2010. On Saturday morning this side of lake was completely ice free. 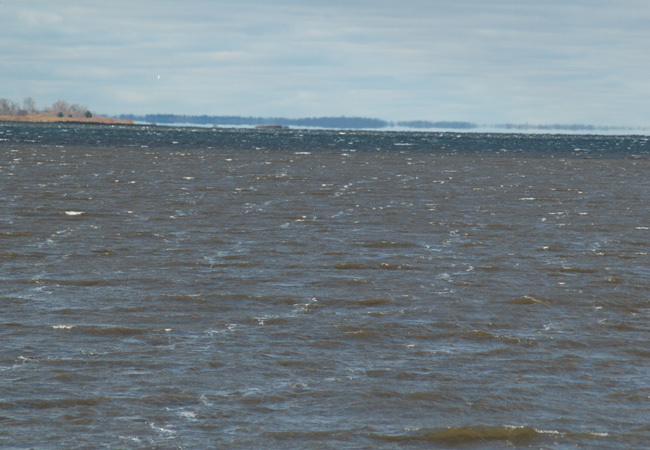 Walker Bay and Shingobee still had open water today, but they're freezing up fast too. Hey, Who cares if it's Zero degrees, look what we got! Annie (L) and Maisie (R) take a few hours out of their busy schedules to help us bag some birds. Stevens Lake, just East of Deer River is still wide open except for the creeks and back bays. It looks like the edges are frozen, but that's just a calm spot that will freeze soon. White Oak Lake, Deer River 11-17-10 Ice out to the inner edges of the Wild Rice, open water toward the center near the old trestle. The Buck that left this mark knows how to use cover to his advantage. Heavy Alders and knee high water are going to make this a tough sneak. 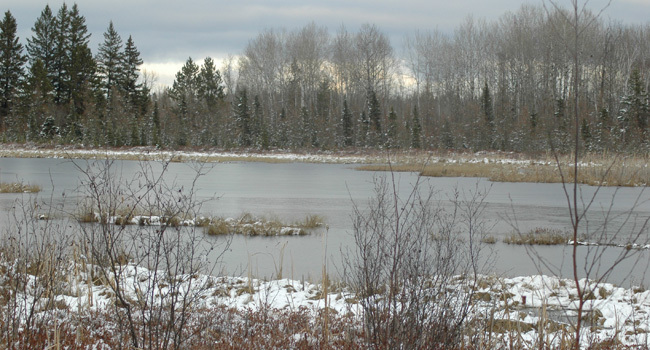 This 5 acre pond North of Deer River was frozen at mid-afternoon on 11-16-2010. A grey, dreary day in the field on Monday. Yes, this was daytime! Even the shallowest ponds remain ice-free. The snow and colder temperatures will be changing that shortly. Hey, you might not be a big fan of cold weather, but nature does have a way of compensating. 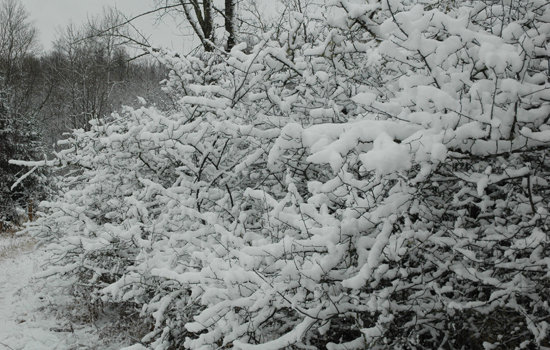 Our Plum bushes will be full of flowers next spring, but for now, the snow makes them every bit as beautiful as they will be then. 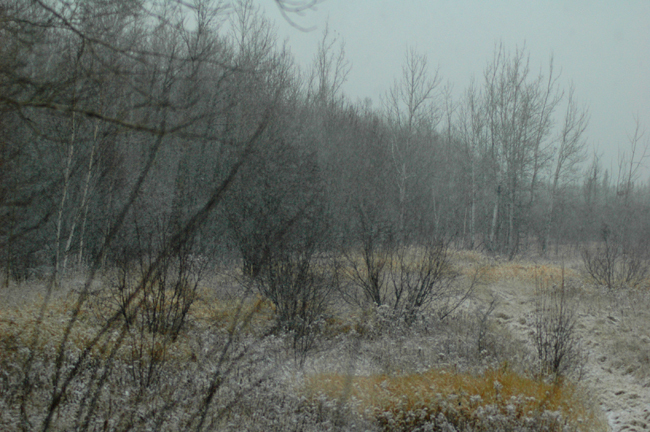 Snow started falling in the Deer River area around 2:00 PM on Saturday. Hey, Old technology still has it's advantages. A little chilly standing here, but it's still good enough to trick a deer. So there ya go! Ice watch 2010. No ice reported as of 11-13-2010 The shallow landing at Little Ball Club Lake is wide open. Here's a picture I got from my buddy Tim Dorholt on Thursday. Our mutual friend Duane Peterson passed on this one last Tuesday and his son, Craig got it yesterday. Now that's a nice guy! 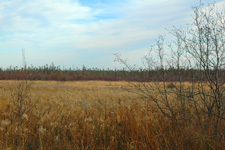 Here's the scene as of November 11, 2010 on a shallow shoreline of Deer Lake. No ice, not even a shiny spot on the bulrushes. 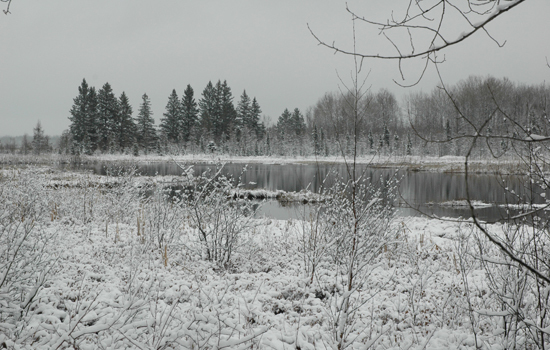 Here's Moose Lake on Novermber 27th 2003. The lake was ice covered and there was already a fish house already out. Deer Lake (below) on the same day. Not frozen yet, but getting there in a hurry. 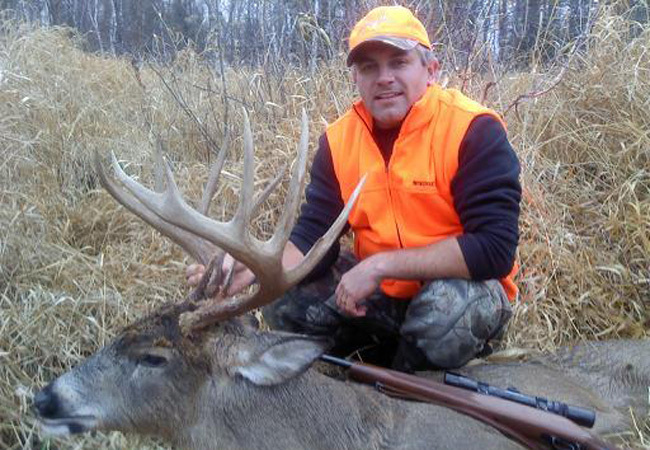 Nine point buck taken by Don Dorholt November 9th, 2010. Picture courtesy of Vern Valliant. My hunting buddy Bill Powell with his Deer. He says he's gonna go fishing now, not a bad idea. Watching Annalee pick up a blue ribbon is a good excuse for skipping the Deer opener. Nice job! It won't be long before this is the view I'll be seeing every day for a while. It doesn't matter that much if I see a Deer or not. After a hectic summer, it's good for the soul to watch out over the land. Martin Wiesner (R) visiting from Germany and Nate Metelak (L) of Hibbing, MN show off a Walleye, double header. Martin's first fishing trip, first Walleye and first shore lunch. Mission Accomplished. Martin and Nate watch the fire, anticipating the main course. 2010 Lund 2000 Alaskan Tiller Boat, Motor, Trailer and accessories for sale. Details here. The view from my Deer stand. Looks like a nice field of tall grass, but underneath the ground is soaked and there's even standing water in places. Hey, that's no fair! These darn things landed right in my back yard, just to torment me. Winnie Dam at the Mississippi River 10/28/10. Too windy to get a good look at anything floating or flying in Tamarack Bay. If there were any ducks on the big lake, they weren't visible from here. 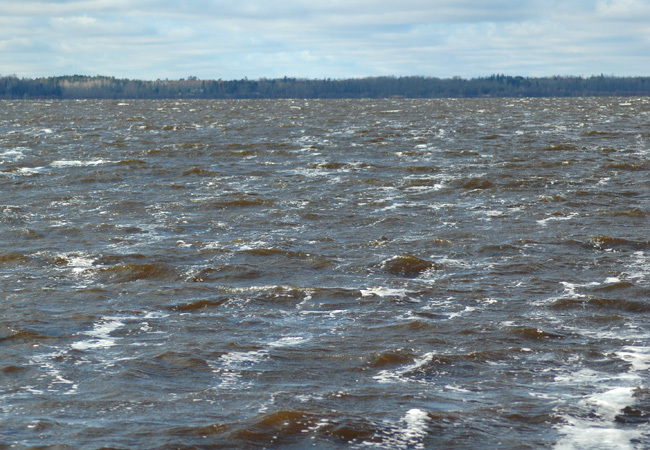 Another windy shoreline at Round Lake. There were a few divers out there, but no big raft and no larger flocks flying around. Another one of life's simple pleasures, Mallard breast ready for the BBQ. Wanna make duck that everyone will like? 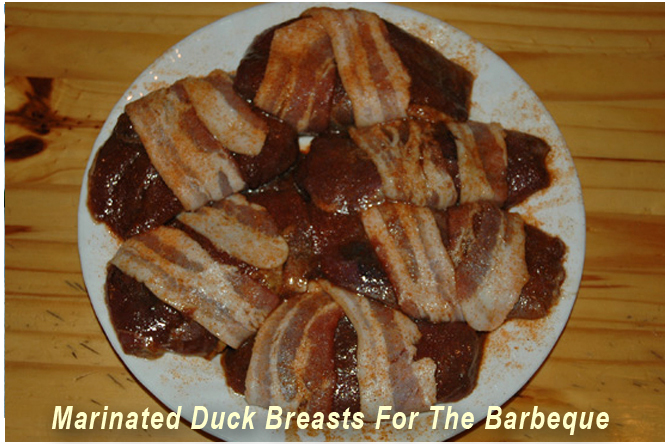 Here a couple easy duck recipes. Hey, Have you ever heard the expression "the best things in life are free"? Being outside at daybreak and sunset will fill your heart beyond belief. 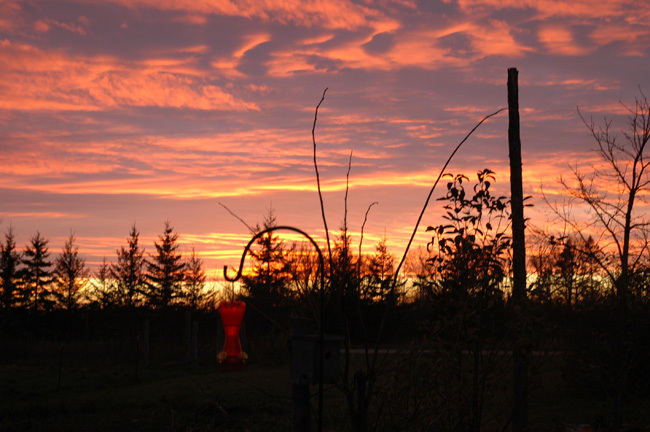 Click here to check out more photos from our North Dakota hunting trip. 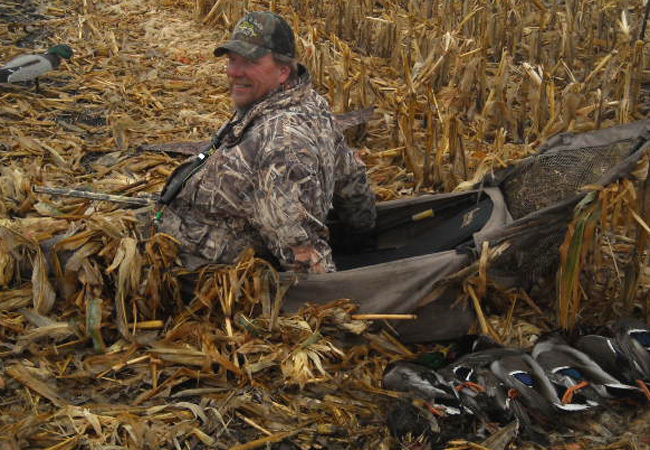 There are lots of Corn fields already picked so finding Mallards is easier than it's been for the past few seasons. Population of puddle ducks like Widgeon and Gadwalls seemed down, at least so far. Pheasants seemed easy to find early in the week, but we struggled to get the last one toward the end of the trip. Bill finally came through at about 4 PM on our last day. Hey, To the un-trained eye, this looks like just another prarie slough. In reality, this is the view from the one of the only places in the entire area that I could ever use my phone to send a text message. Luckily, it's also one of Bill's favorite Pheasant spots, so we had some reason to visit ocassionally.